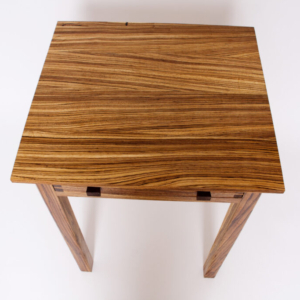 Stunning walnut and sleek carbon fiber accents make this a unique table for generations to come. 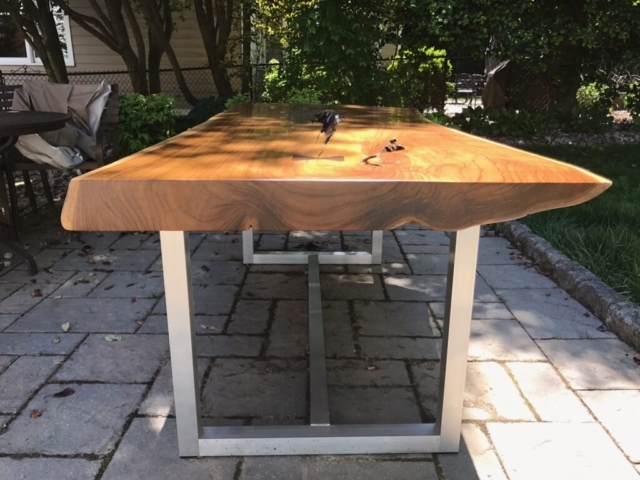 Thick 8/4 (2″) bookmatched live-edge walnut with steel quadrilateral legs make this a conversation piece, dining table, homework table, and kitchen table. The carbon fiber “pond” accent brings the Future Primitive look to this 8′ long x 3′ wide table. 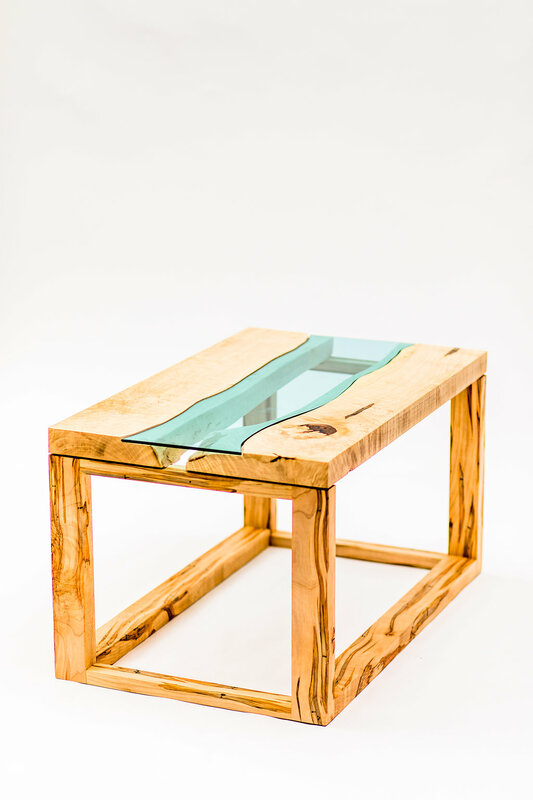 Tables can be river tables filled with epoxy or glass, or smaller, contained “ponds” filled with various items – carbon fiber in this case. 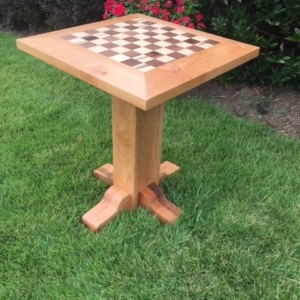 Think about most outdoor tables? 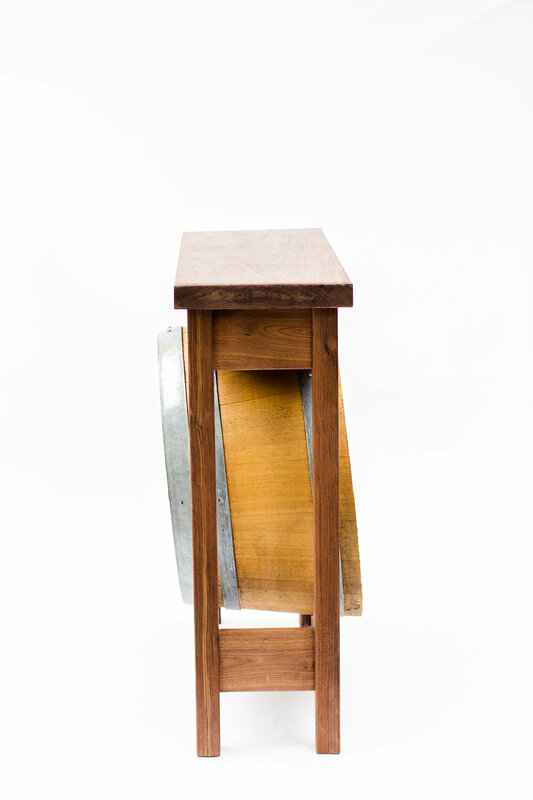 Flimsy, rusty, neglected, etc. 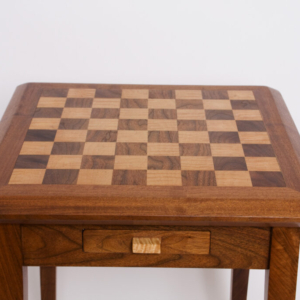 Think no more. 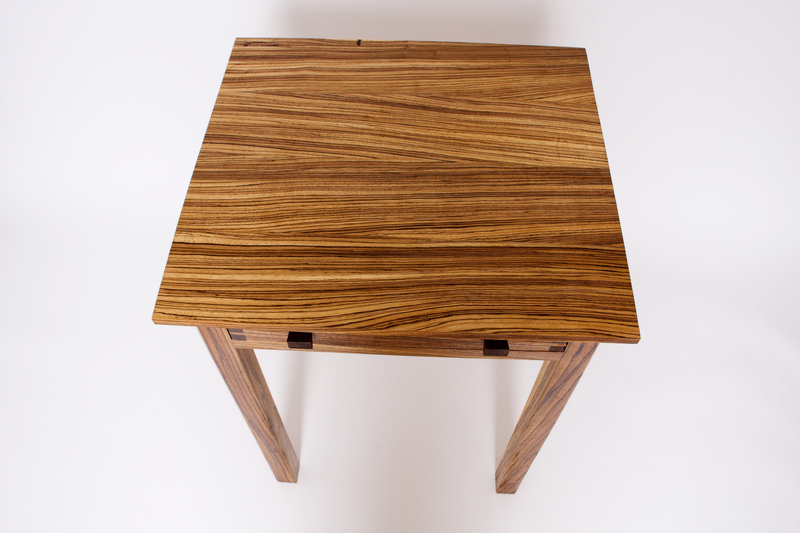 This outdoor dining table made of 4″ thick (16/4) Costa Rican teak out of a single slab will be the envy of the outdoors. 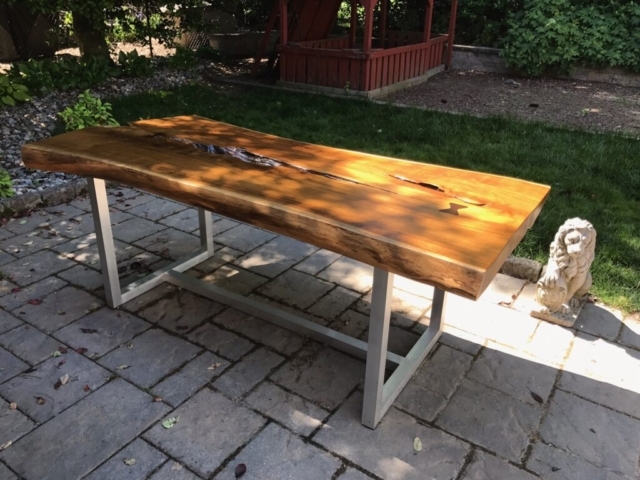 There is simply nothing like a beautiful outdoor table in which to enjoy company and nature. 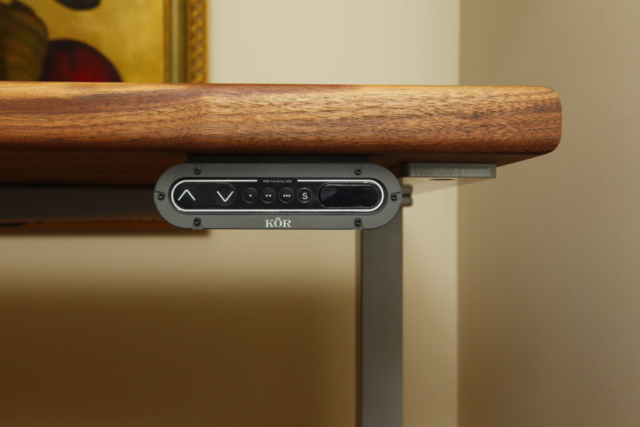 The rust-free aluminum base requires no maintenance as does the top. Finished in teak oil and two coats of polyurethane, you simply need to cover this nightly to protect it from the elements. 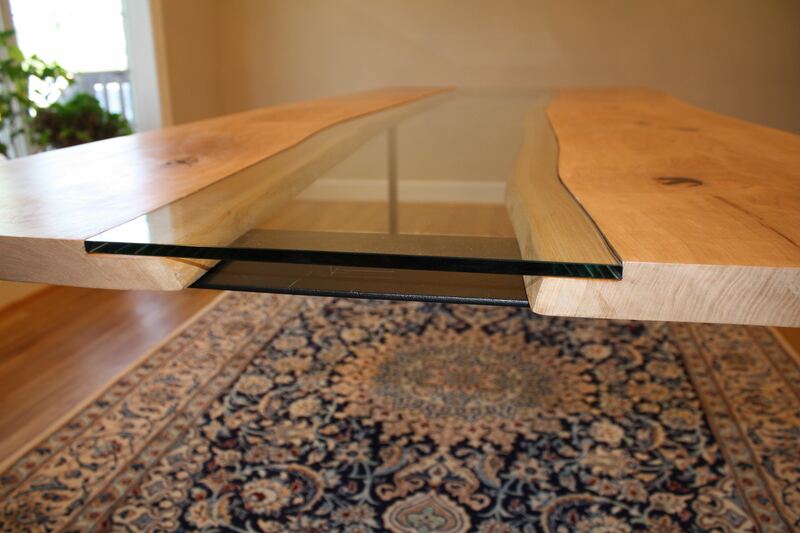 The table is 85″ long by 36″-40″ wide. 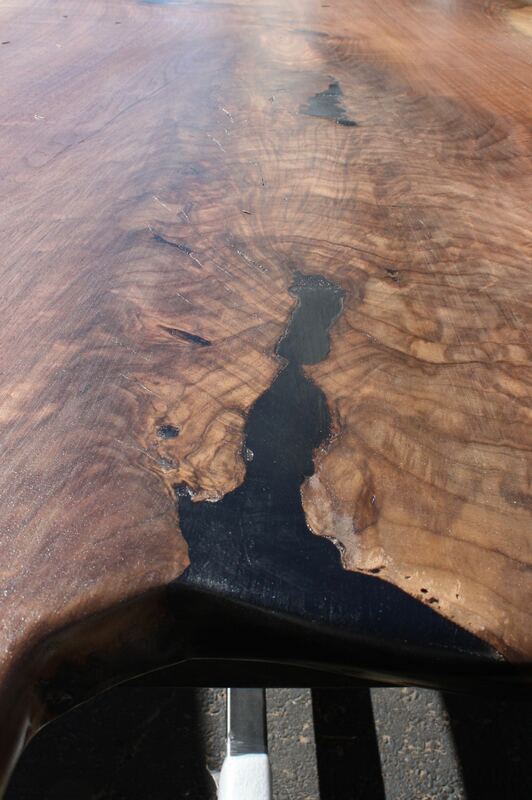 Other slabs are also available. 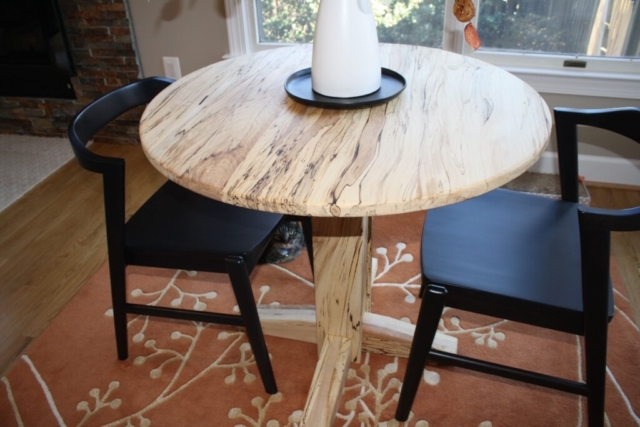 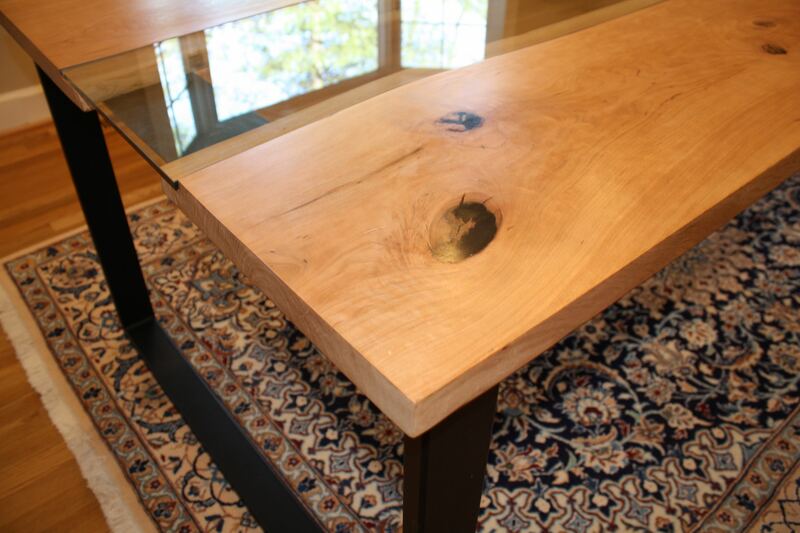 The natural void in the middle of the table adds character and allows for ample creativity. 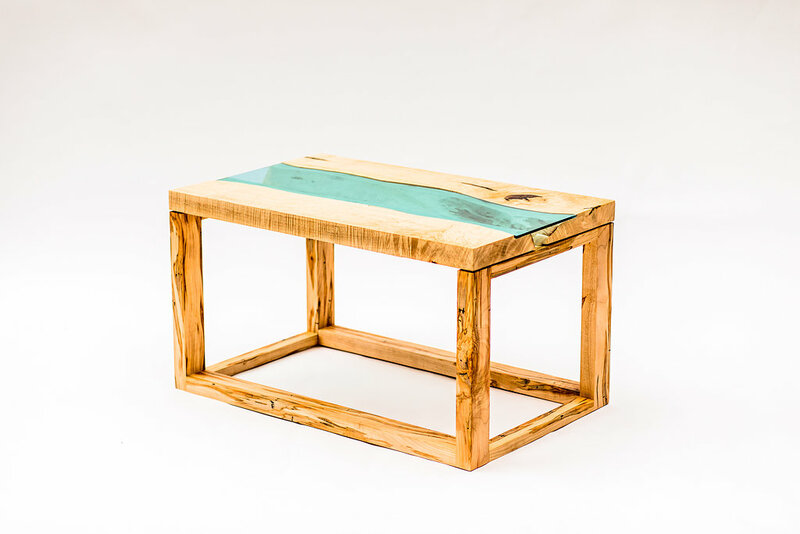 If your home can support it, you need to make a statement. 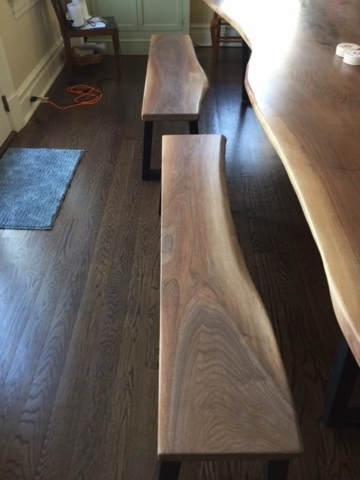 Dinner parties seating 14? Holiday meals in full splendor? 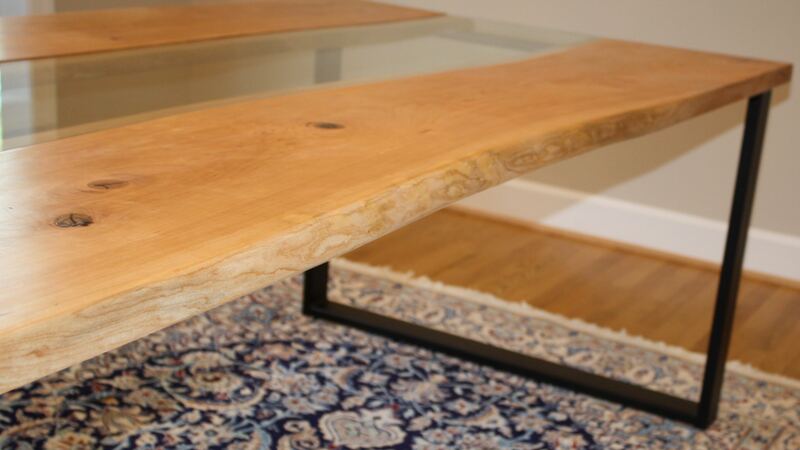 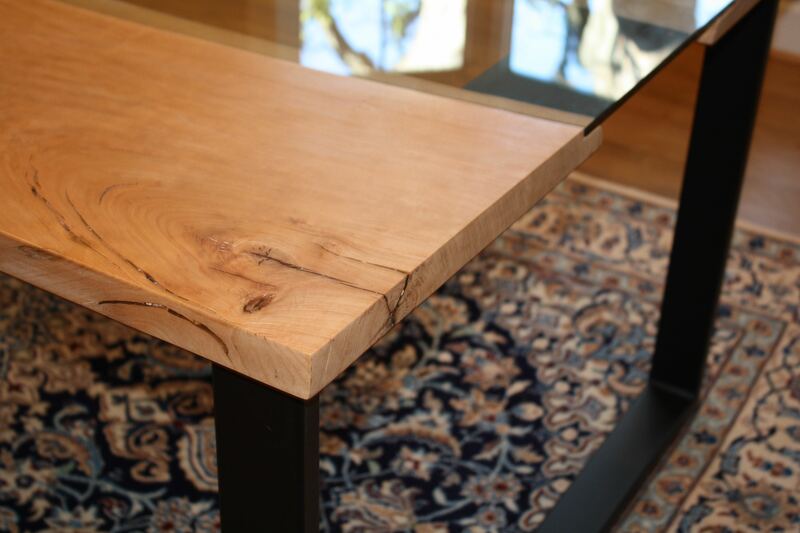 All can be yours with a larger-sized table from our live-edge slabs. 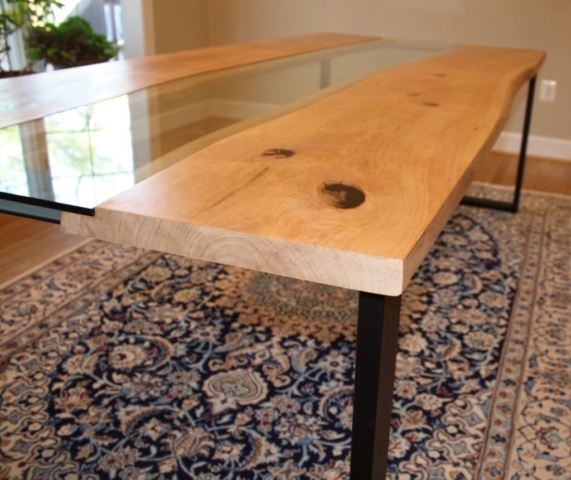 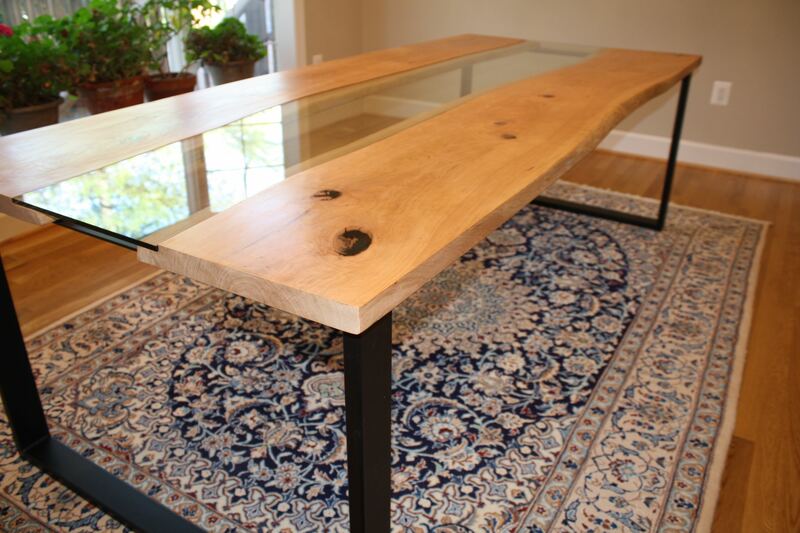 Measuring 12′ long by 50″ wide, this table is sure to impress even the most urbane neighbors. 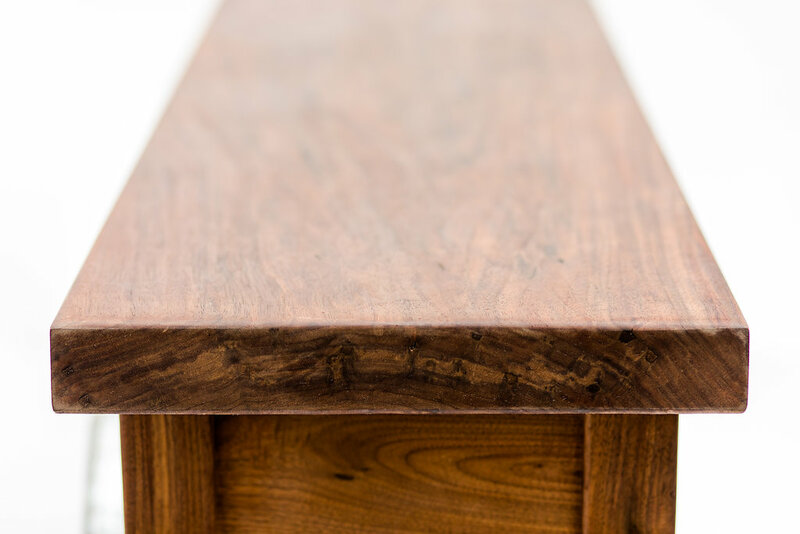 Made from a walnut tree as old as the United States, the heft is substantial – from its length, width, depth, and character. 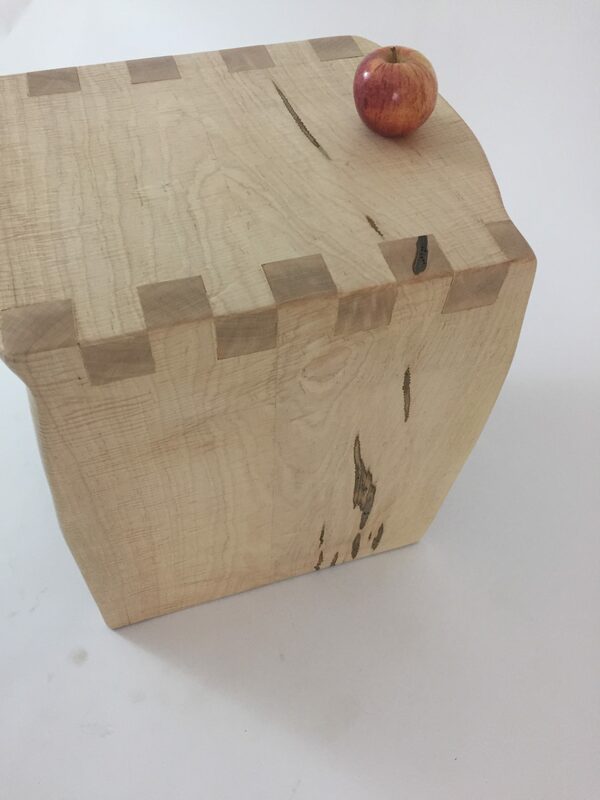 First, a lesson on crotch. 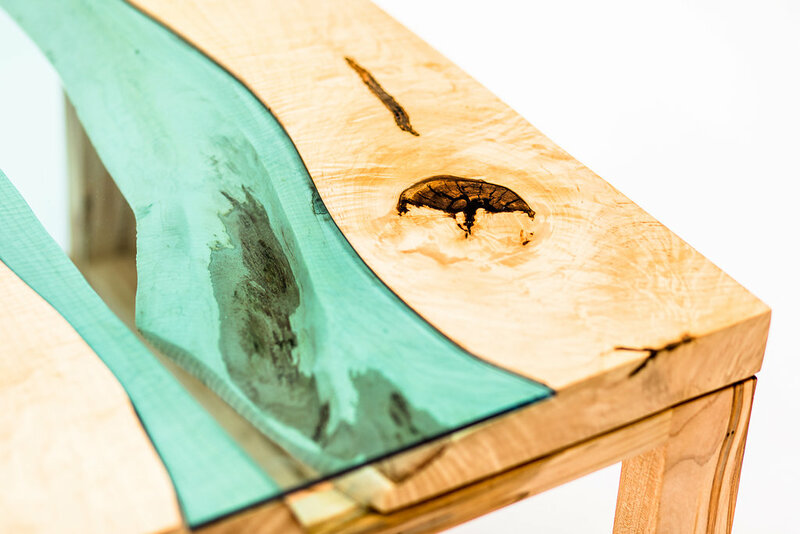 When a tree knits together two branches the flame-like 3D grain results can be stunning, and to make this even more interesting we filled in some of the crotch flame with a tinted epoxy to make it just right. 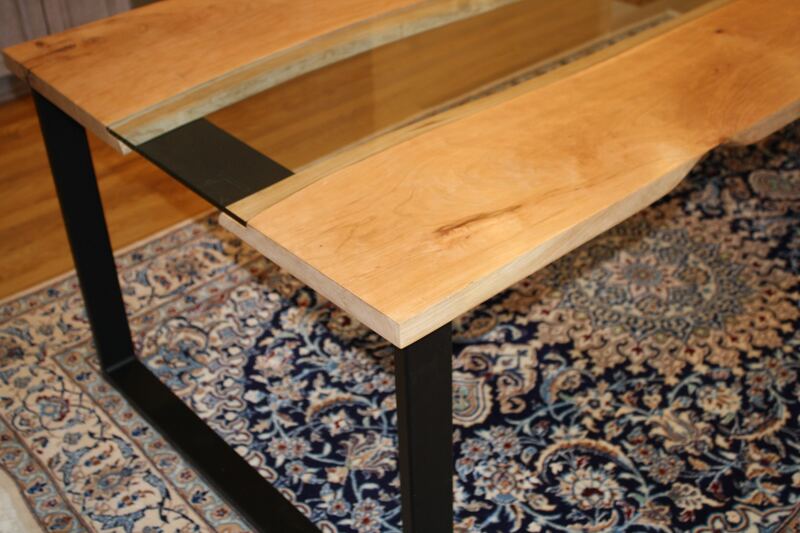 This table certainly is. 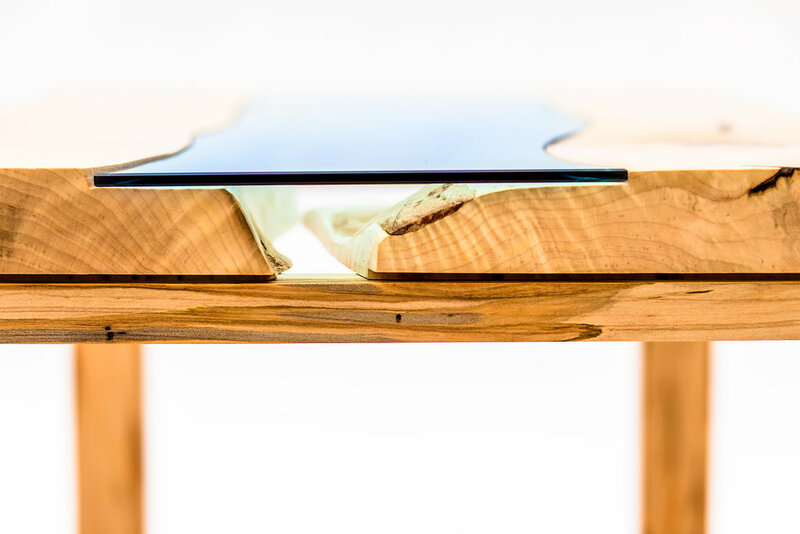 Statement tables can be built from 9′ to 16′ long. The table is 12′ long by 44″-50″ wide. Other slabs are also available. 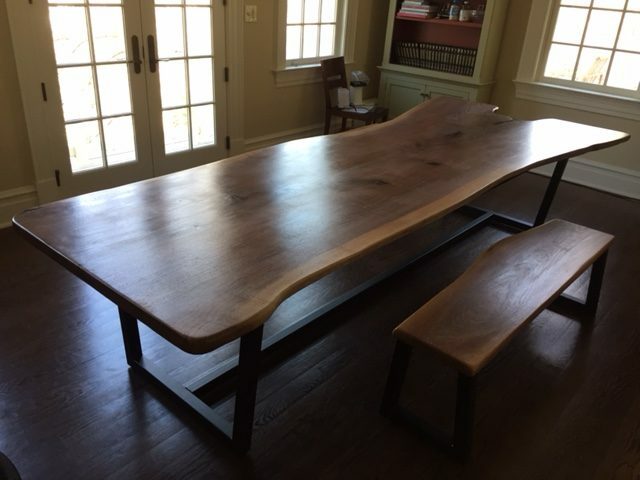 I completed my first river table in the late 80s in High School woodshop class. 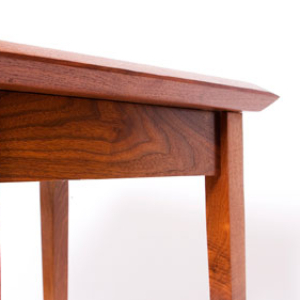 Mr. Windt gave me an “A”. 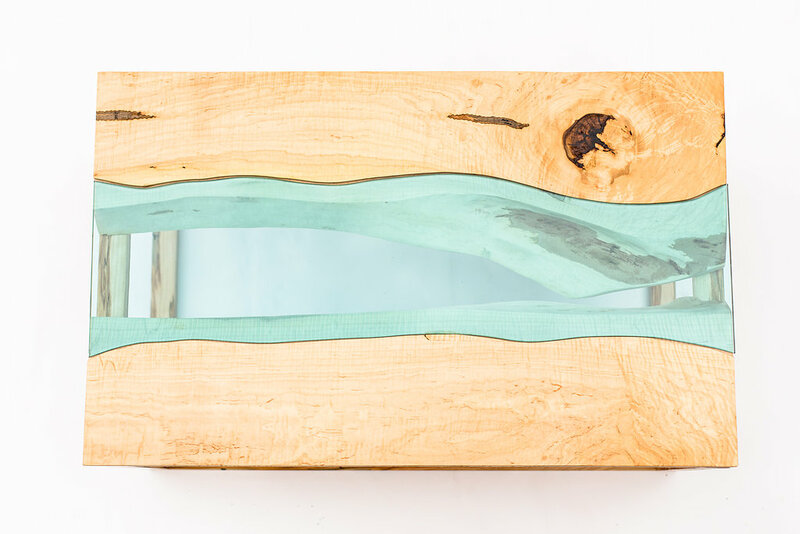 My skateboard broke in half almost perfectly, and I added a brown-tinted epoxy in the middle to model after the nearby mighty Little Lehigh River running through a classic skateboard’s river banks. 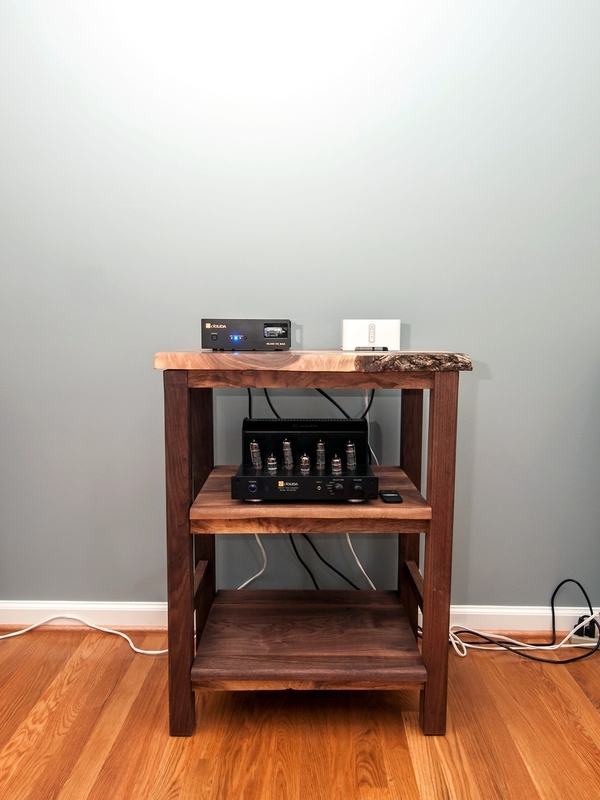 Much has changed since then, but really, nothing has. 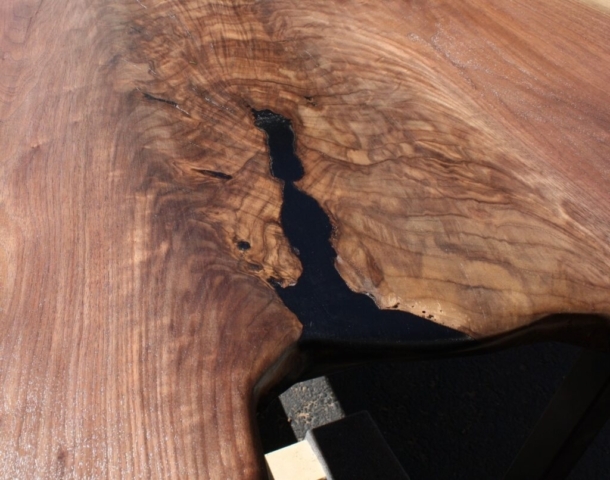 You still need beautiful wood slabs as the river banks. You need some sort of glass or epoxy resin as the river. 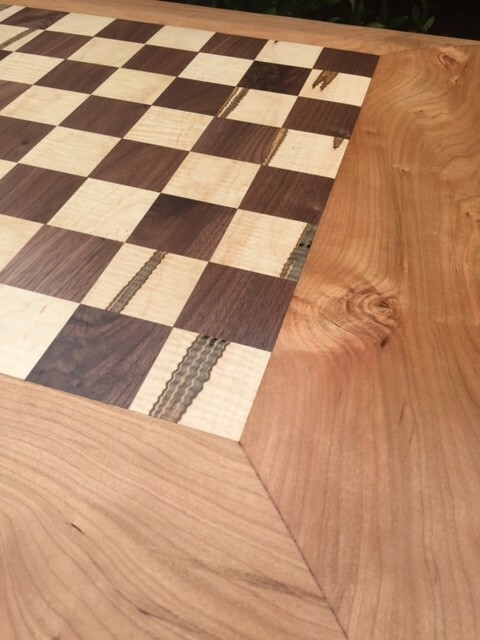 You must have character and live edges. This river table is 96″ long by 42″ wide built atop cold American steel by Symmetry Hardware and custom river glass by Chevy Chase Glass. 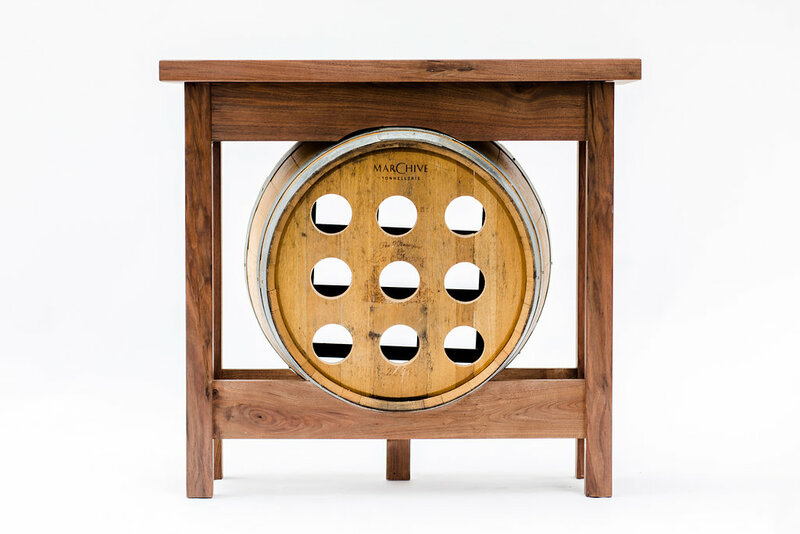 This is a high-end wine display table unlike any other. 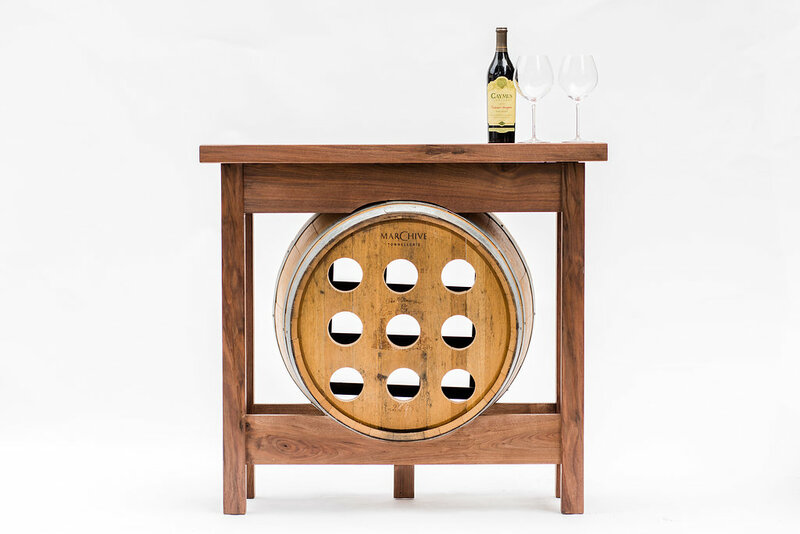 I used an original wine barrel as a key component in a stunning walnut furniture piece that goes equally well in your wine cellar as it does as a sofa table. 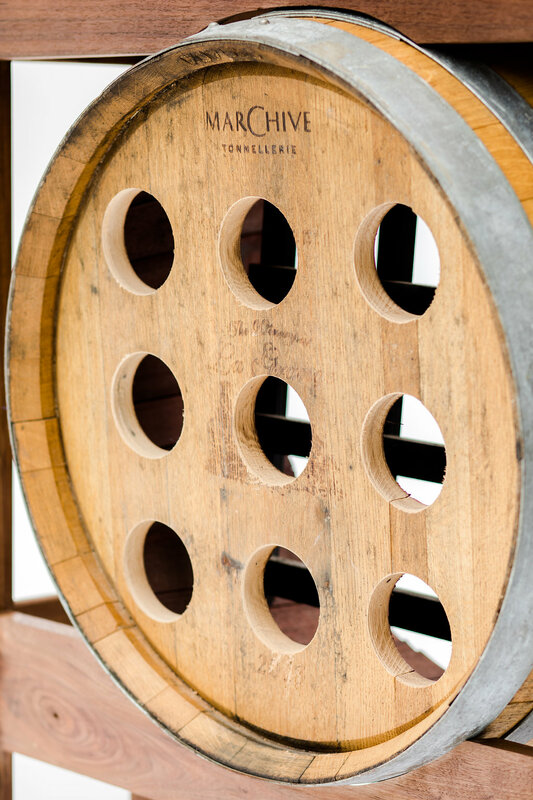 It holds nine (9) standard bottles at a slight downward angle as all good sommeliers expect. 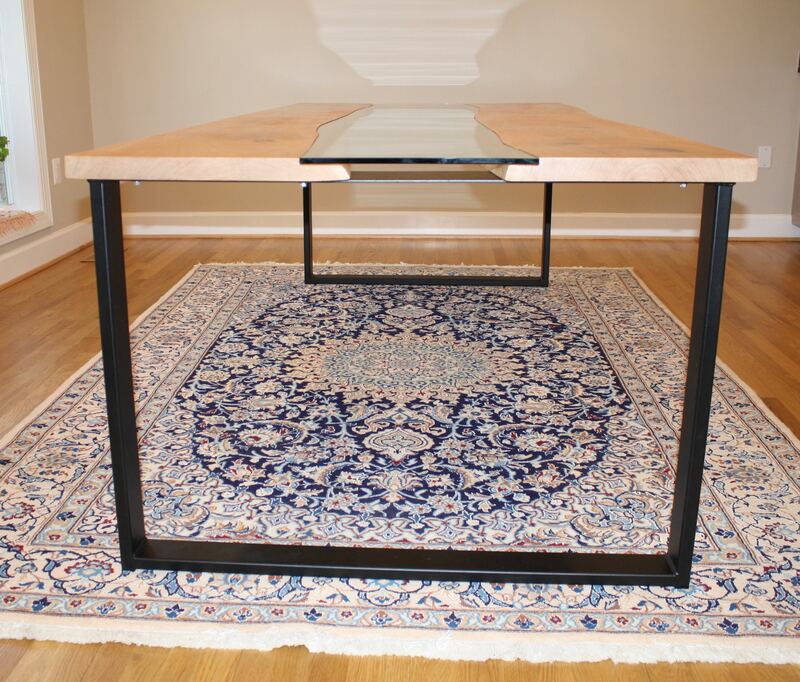 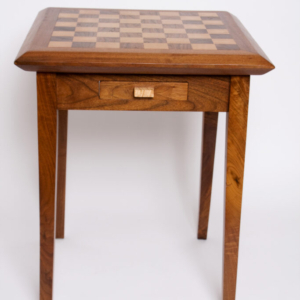 The table is 41″ wide, 38″ tall, and 14″ deep, and other tables can be custom sized to your specifications. 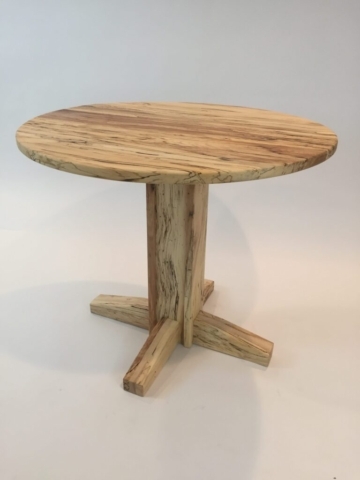 I can even take your barrel and turn it into a table. 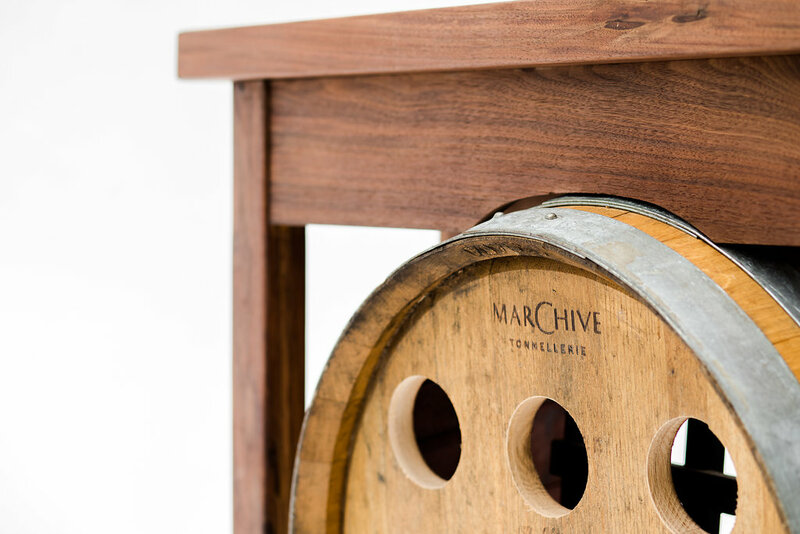 Collaborating with the barrel masters from the Marchive Tonnellerie, this one-of-a-kind piece built with Virginia walnut surrounds the 9-hole barrel to show off crisp walnut lines in a mid-century modern (MCM) style. 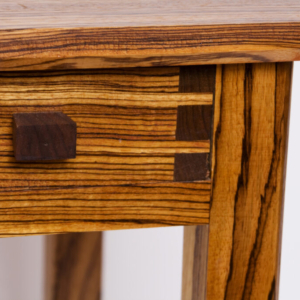 Coupled with the raw barrel in oak, the piece elicits a stunning mix of old and new. You can still faintly smell the “big, bold” red wine used originally in the barrel. 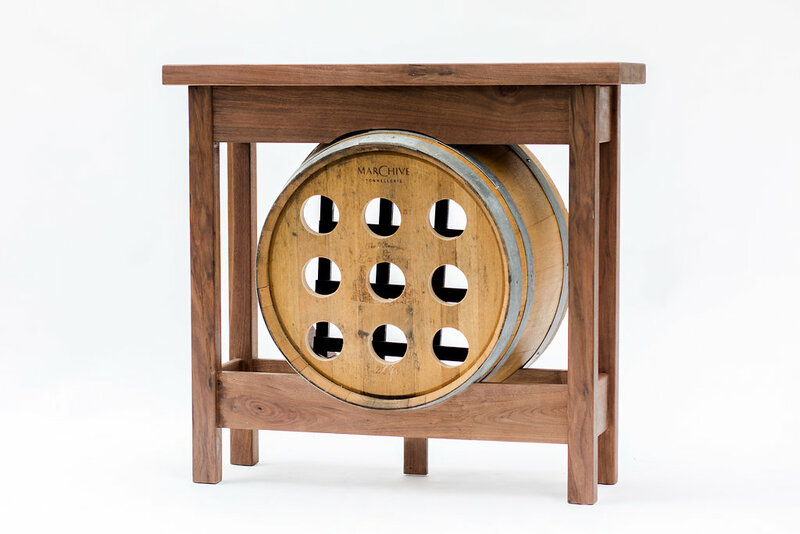 With such a unique piece, you could show off nine of your better bottles upstairs, or just place your everyday wines in this display while your high-end bottle remain safely tucked away in your cellar away from prying guests. 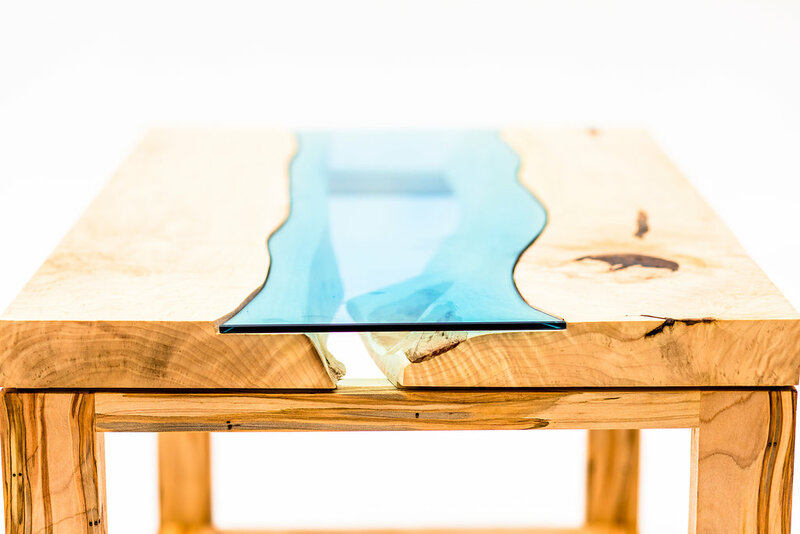 A river table highlights a piece of glass atop it to fit within a recessed section. 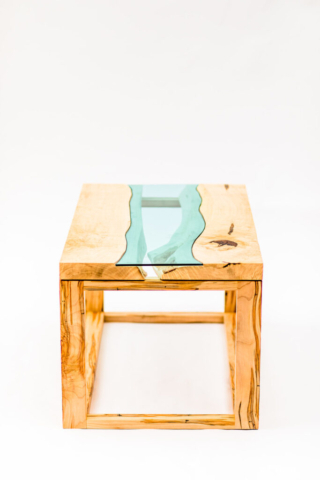 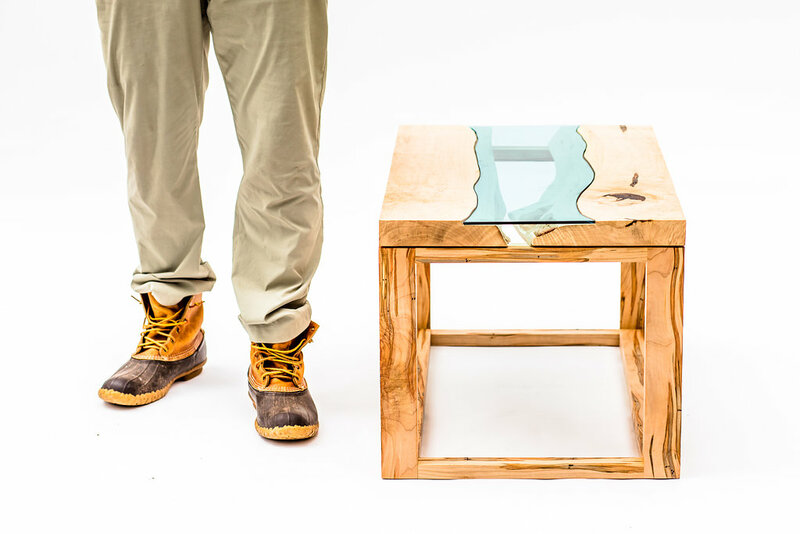 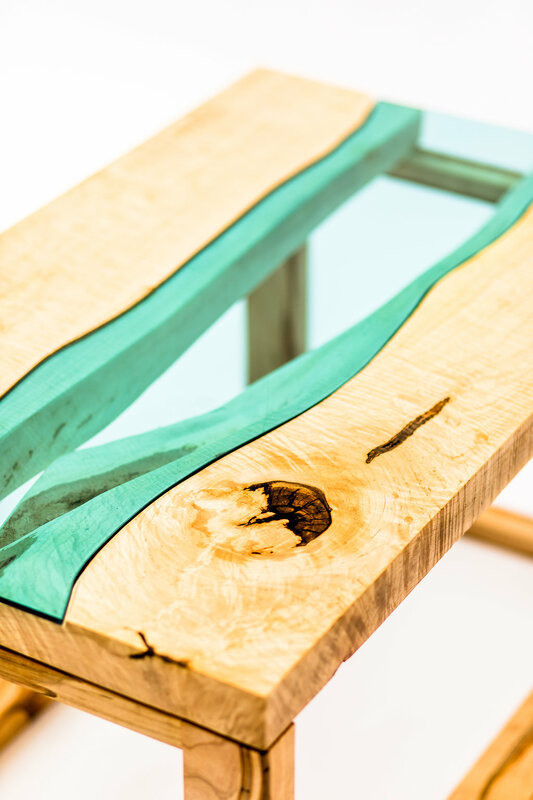 In this ambrosia maple coffee table, a piece of 3/8″ Azuria (cool green) hand-cut glass is used to mimic a river running through the maple banks. The live-edges under the glass show nature’s irregularities while the outsides of the wood have clean, straight-edge cuts with a tasteful 1/8″ reveal separating the solid 2″ top from its 1.5″ thick base. 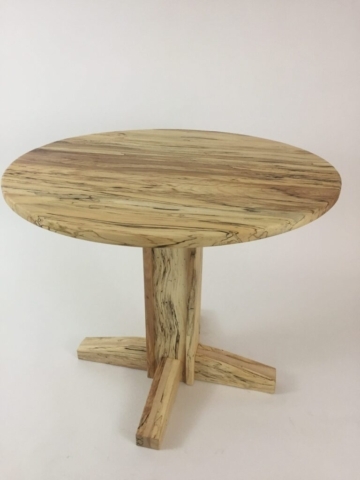 This is a one-of-one piece for sale. 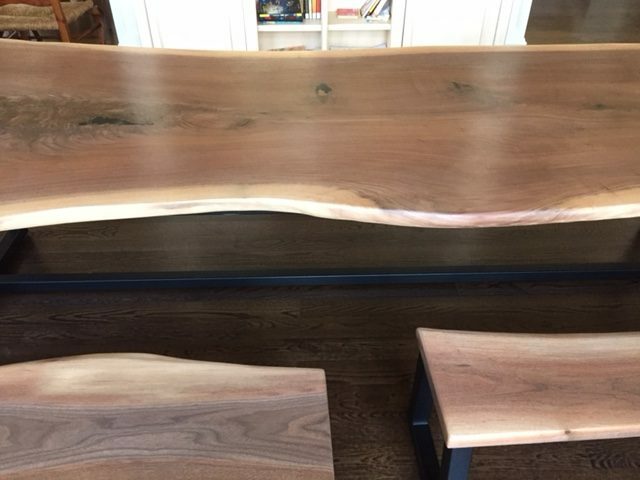 Other wood species can be used to make a custom size river table anywhere from 2′ to 16′ long for entry tables, sofa tables, coffee tables, and dining tables. 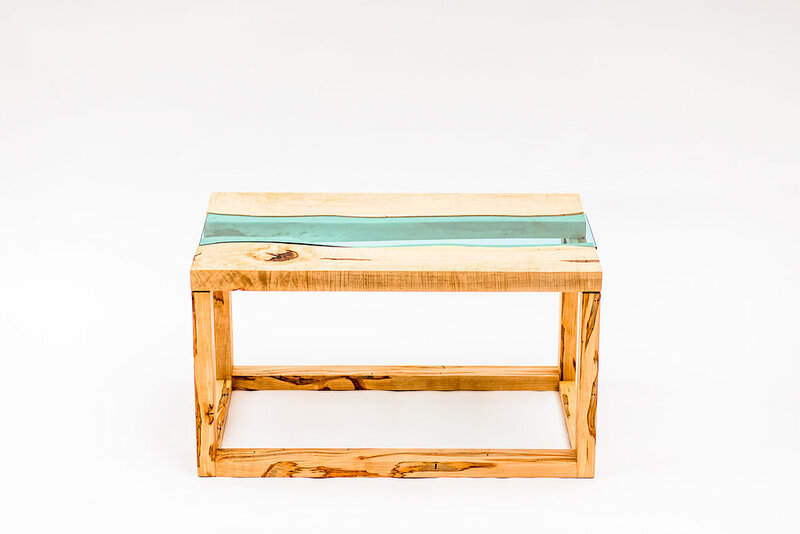 This river table is 39″ long, 20″ wide, and 18″ tall. 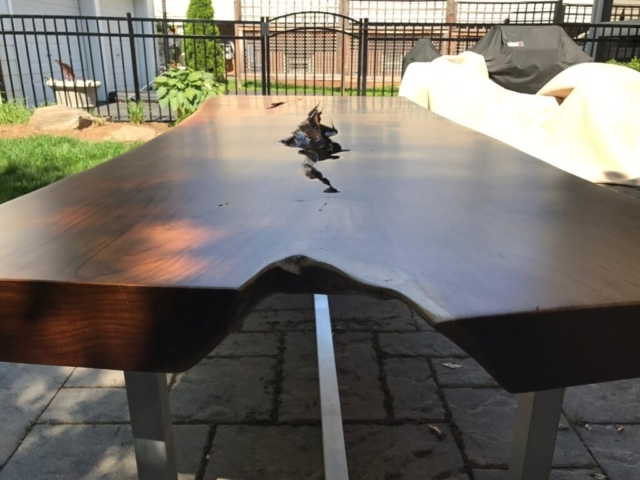 Other river tables can be filled with epoxy, as I have for sale on other listings, or the more adventurous pieces have voids filled with even more interesting materials – such as river rocks or cooked spaghetti. You need this table. 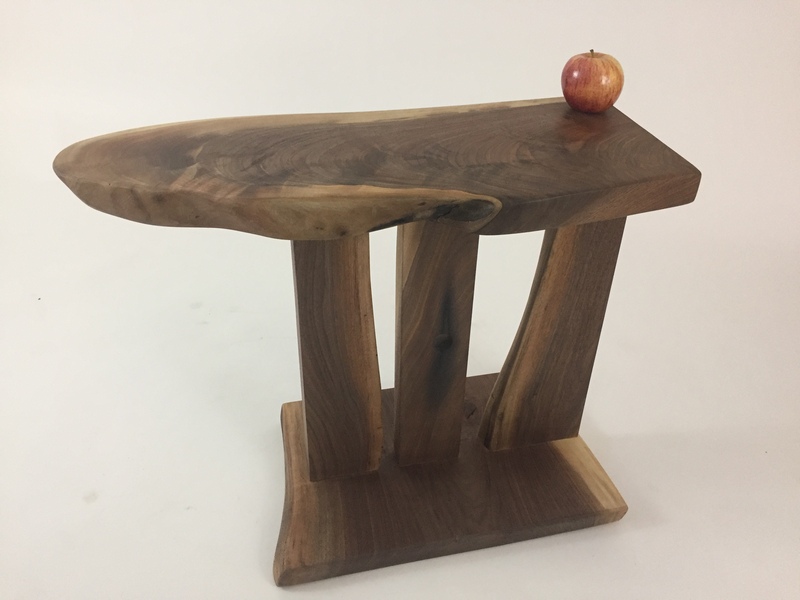 You want this table. 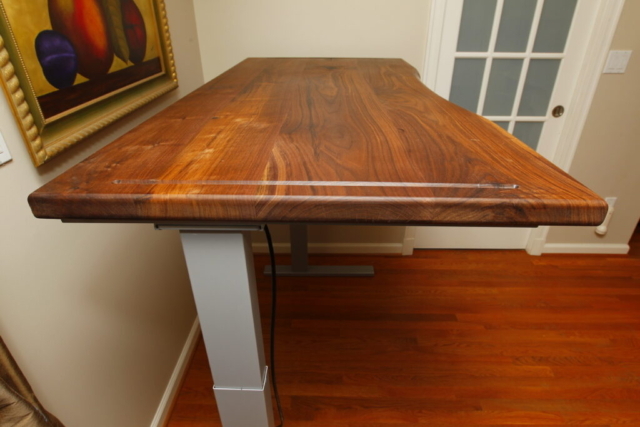 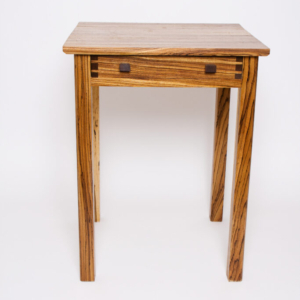 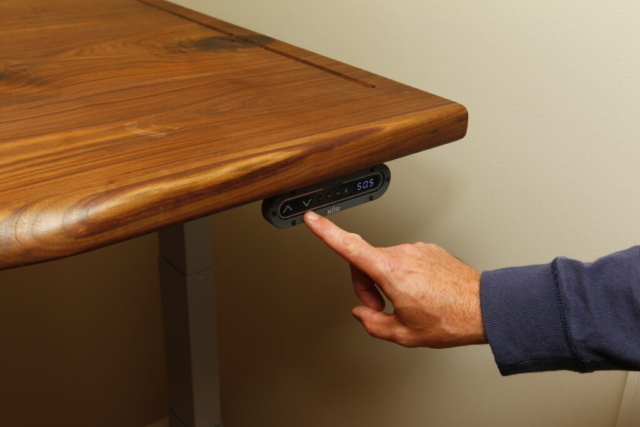 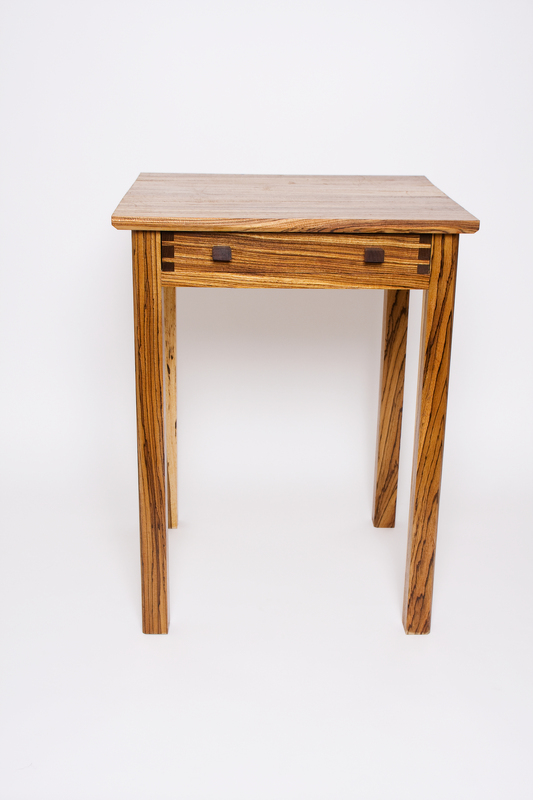 Made of sustainably-harvested Virginia hardwoods such as walnut, maple, cherry, or beech, this adjustable height table sits atop a high-end motorized base that raises and lowers the table from 24″ to 50″ with the push of a button. No lifting or cranking required. 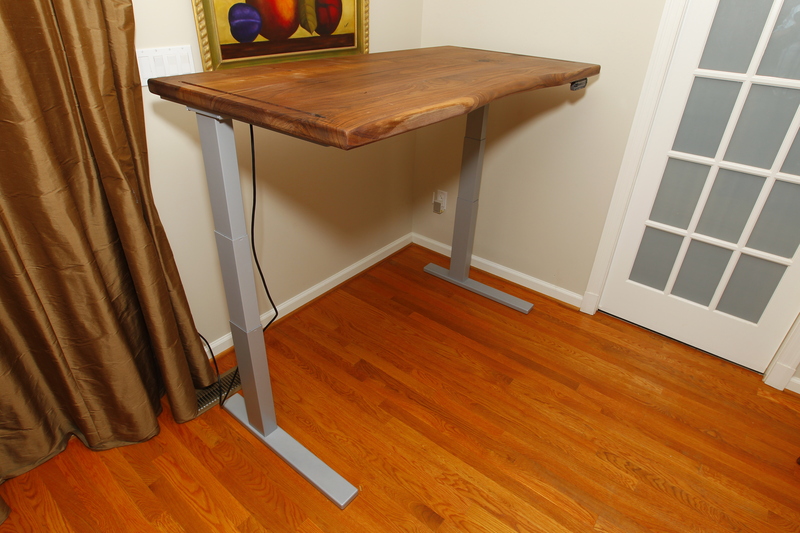 The adjustable height table base comes in grey or black. The dimensions range from 30″ deep to 60″ wide and can be as large as 36″ deep by 72″ wide. 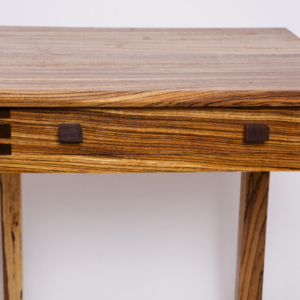 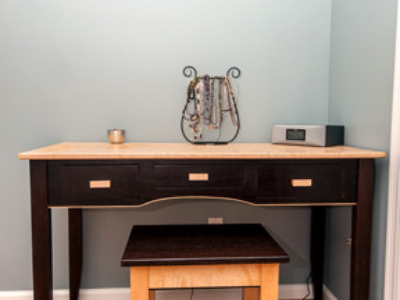 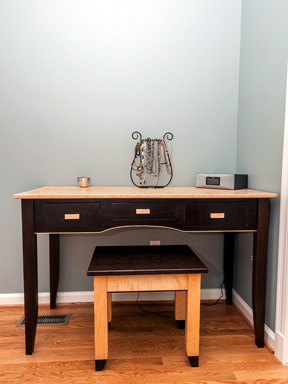 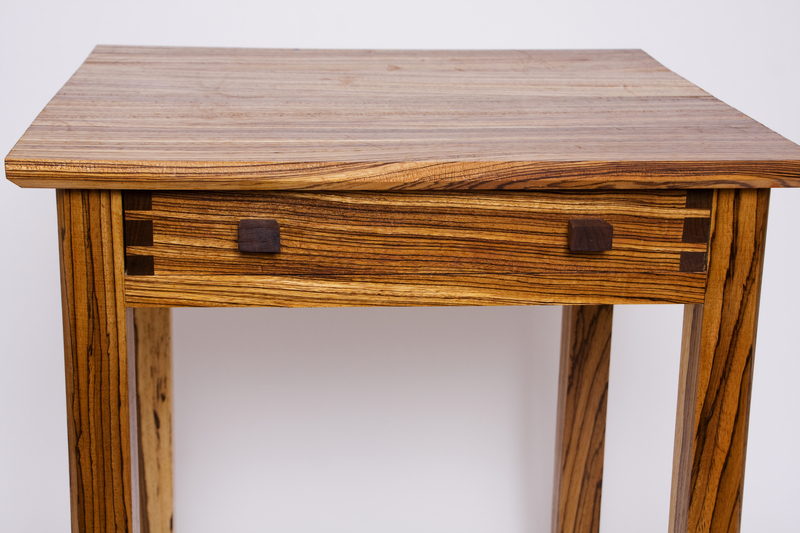 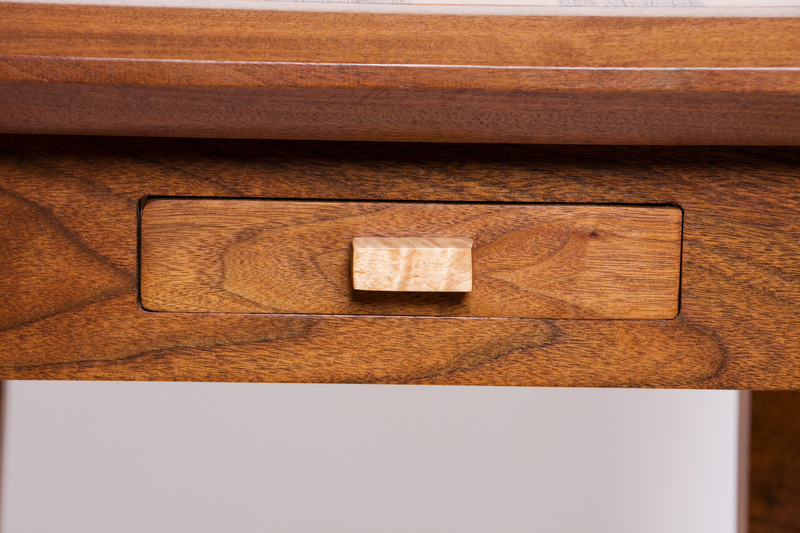 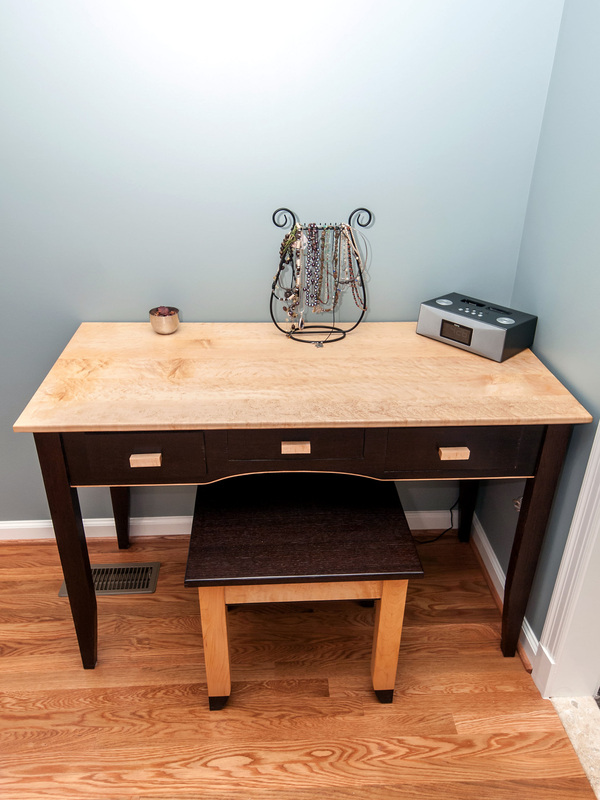 Custom touches include center drawers and routed pencil grooves, so your pencil and pens never fall off the side again. 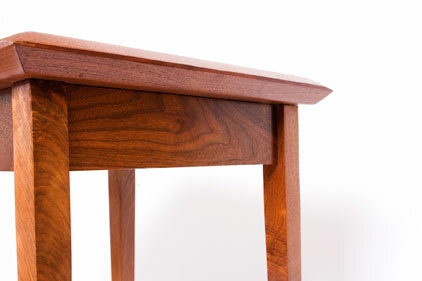 Shown in walnut with a center convex carve out to maximize ergonomics. 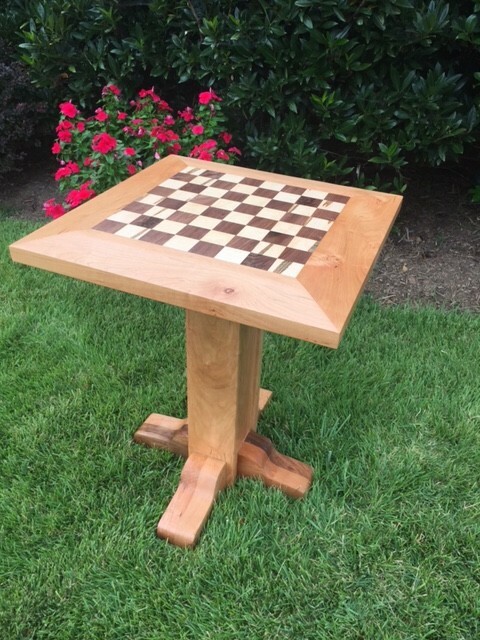 This was my first Virginia-based piece. 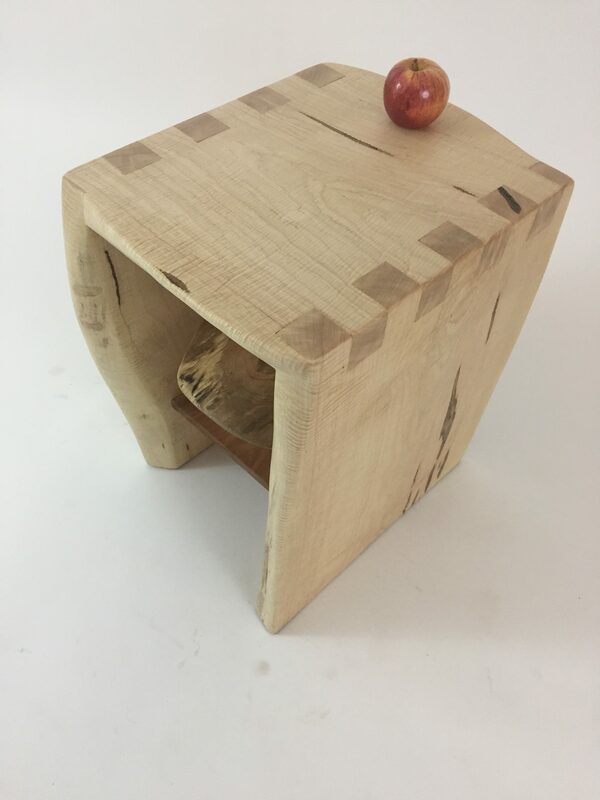 It was inspired by the artisan, good man, and good friend Brett. 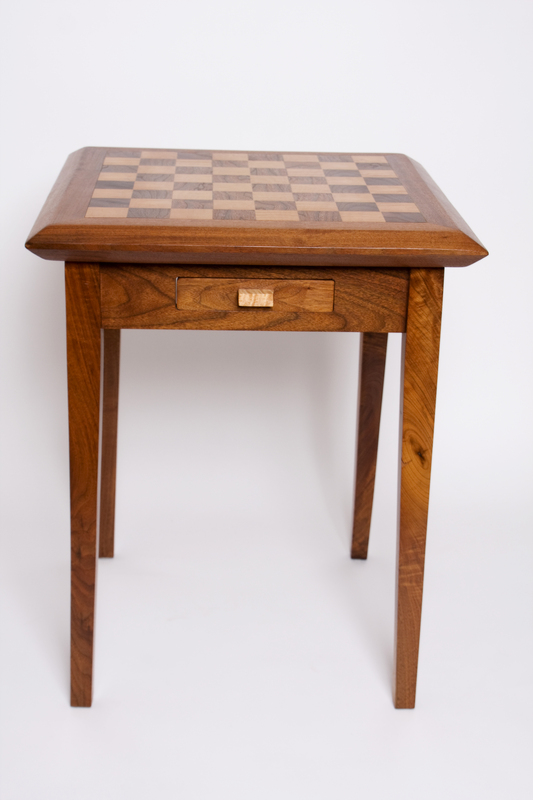 The right height, width, and form for a chess match. 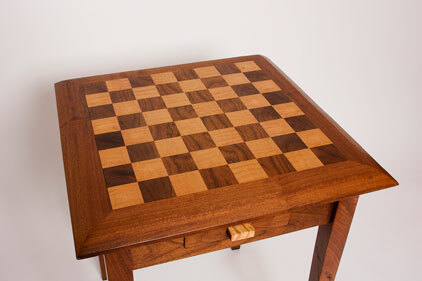 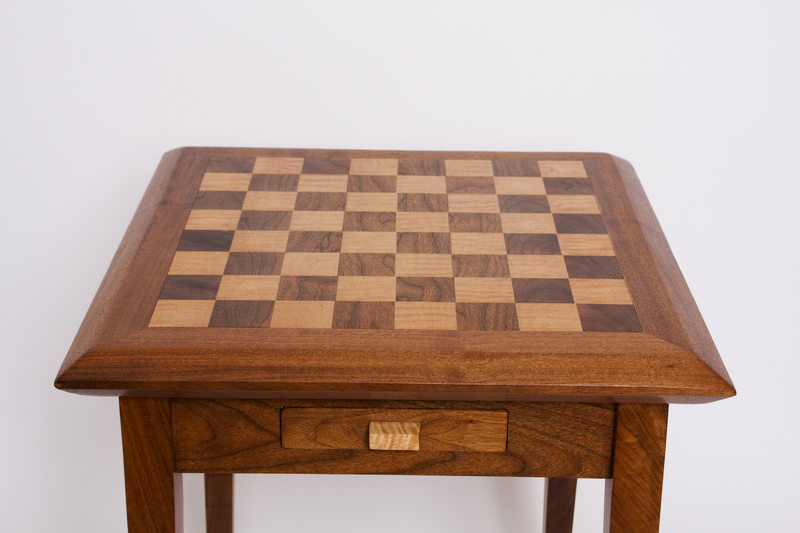 Or, place it in a corner and have your friends think you are secretly part of the urbane chess set. We have made many of these tables with many different bases and different tops. Also pictured is an Ambrosia Maple and Black Walnut table atop cherry. 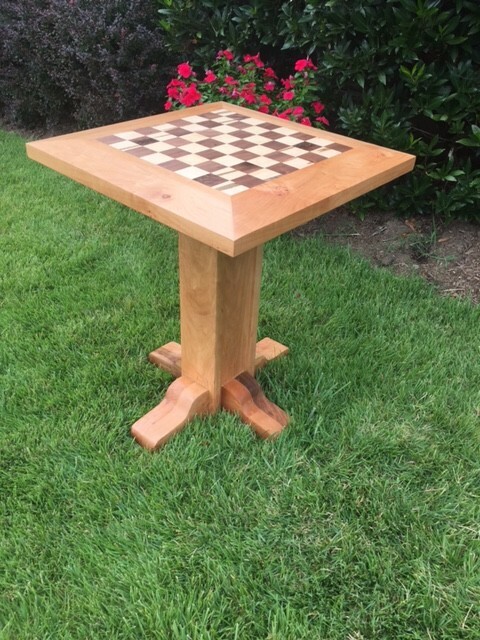 I don’t know how to put this, but I’m kind of a big deal in chess. 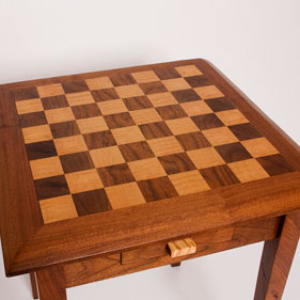 Chess people know me. 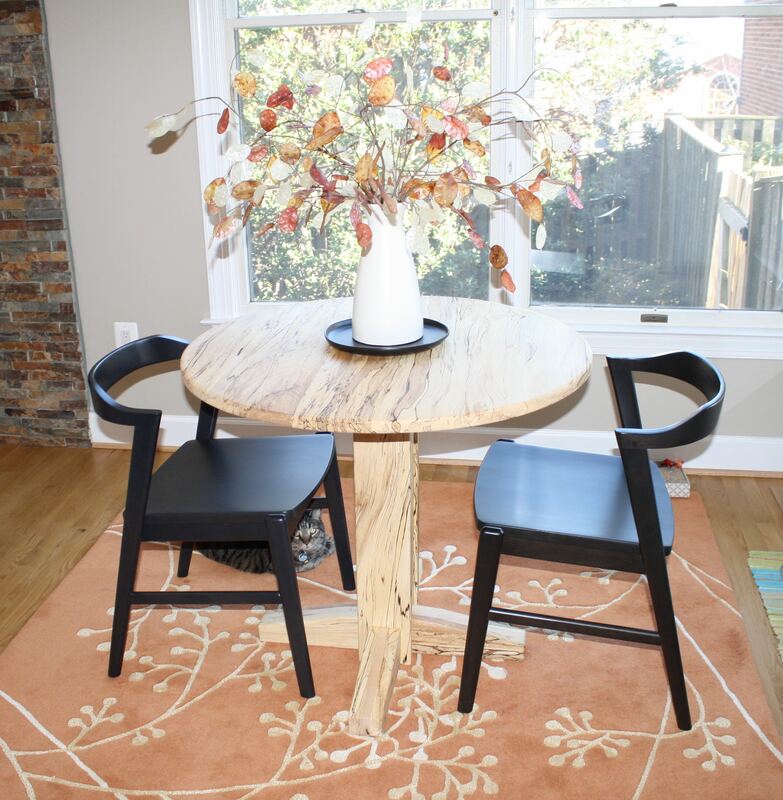 Somewhere between a statement dining table that seats twelve and a side table sits this breakfast table perfect for two, three, or four. 36″ wide and made of stunning spalted beech, I make these in most American hardwood species and widths up to 60″. 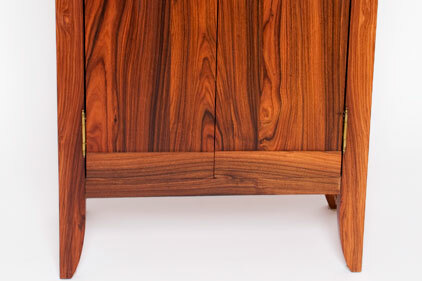 The legs are modeled after the smooth lines of a Lamborghini Murcielago. Spalting is a process that creates Jackson Pollock-like thin black irregular lines in the wood. 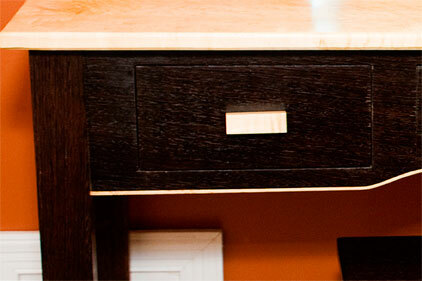 Virtually all the hardwood we use are FSC certified woods. 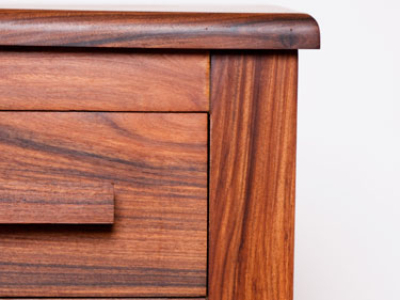 Except this one – with an asterisk. 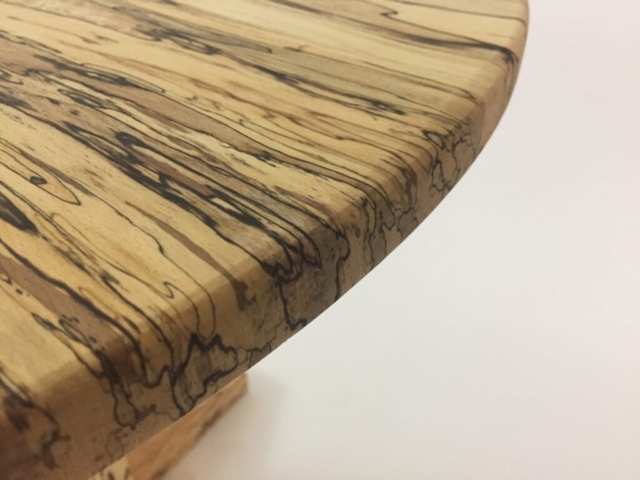 When Prada’s flagship Manhattan store – covered in Zebra Wood (from Gabon) – removed some of its conspicuous wood, those rough boards became the boards that became this table. 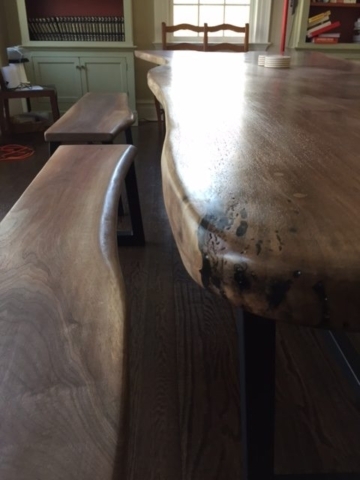 Provenance? 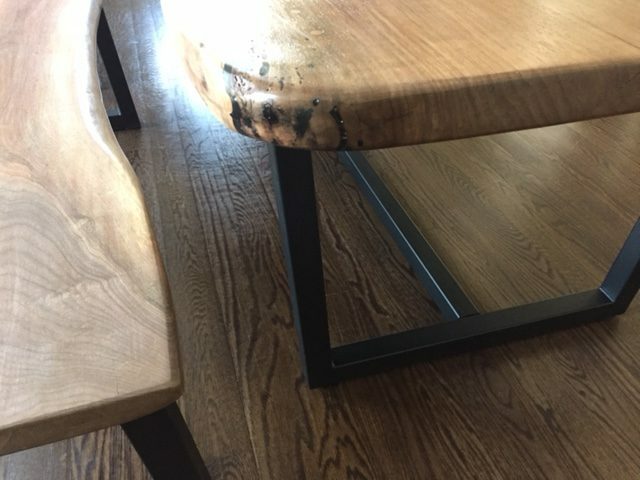 Sure. 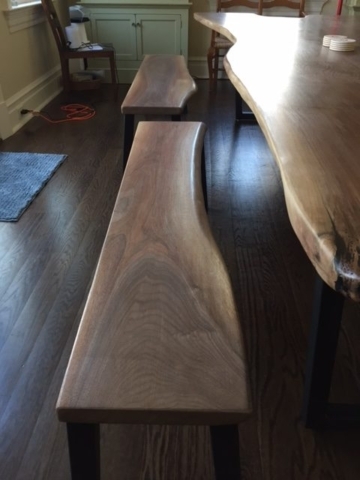 Cool looking? Yes. 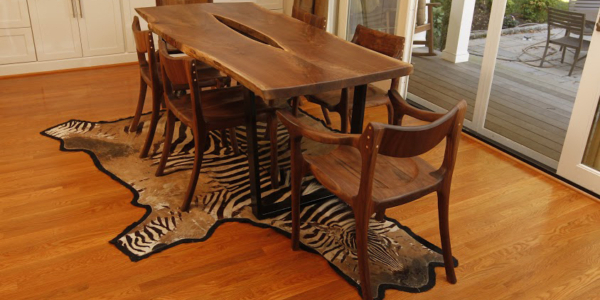 PETA friendly? 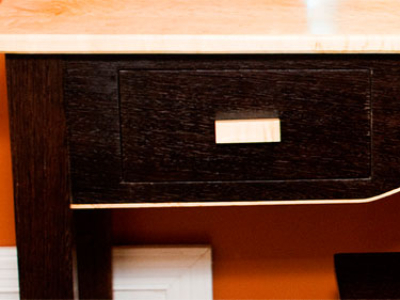 Definitely. 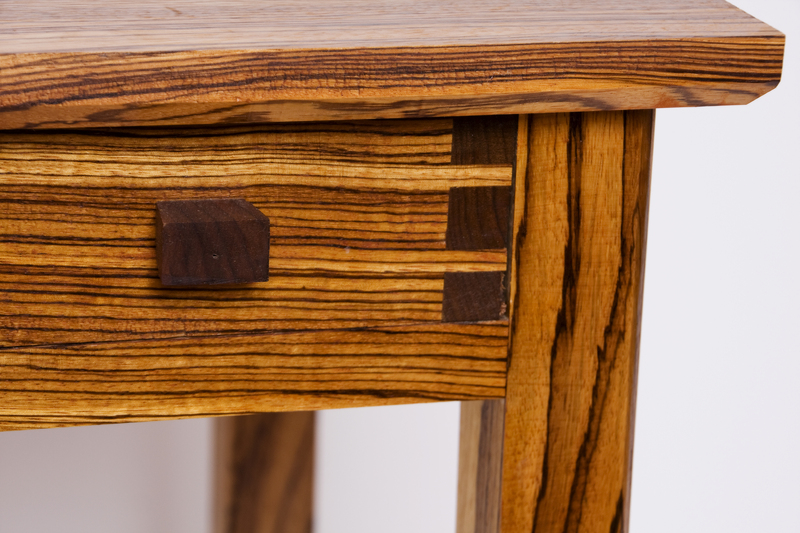 Working with real wood, I come across pieces that have interesting stories. 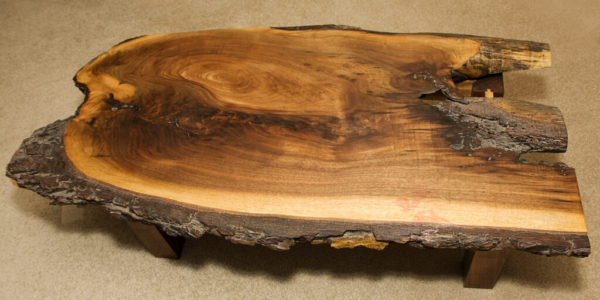 This live-edge walnut slab had a .45 caliber round embedded in it, and it simply had to become some sort of badassery furniture. 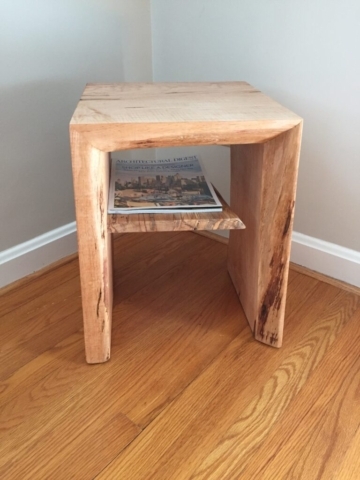 I will build your custom side table in any shape and size. 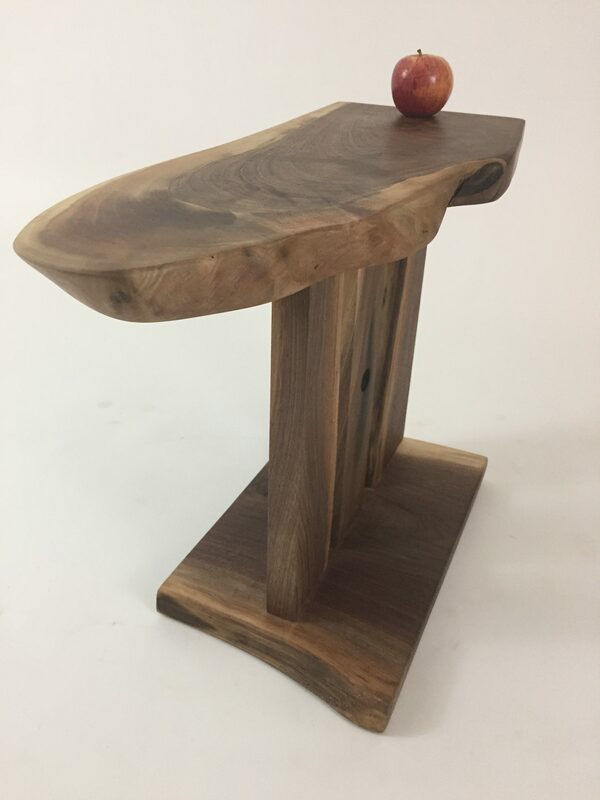 Shown in live-edge walnut for the top, legs, and base. 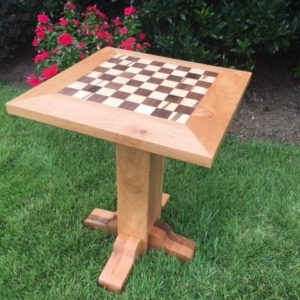 Dimensions are 25″ tall, 18″ wide, 24″ deep. 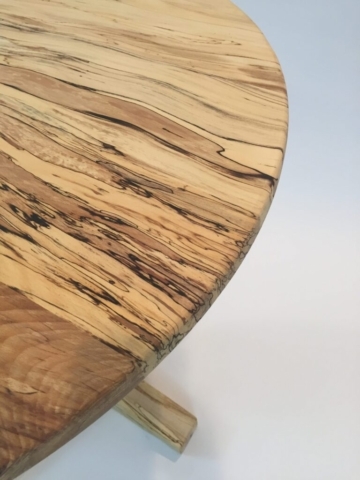 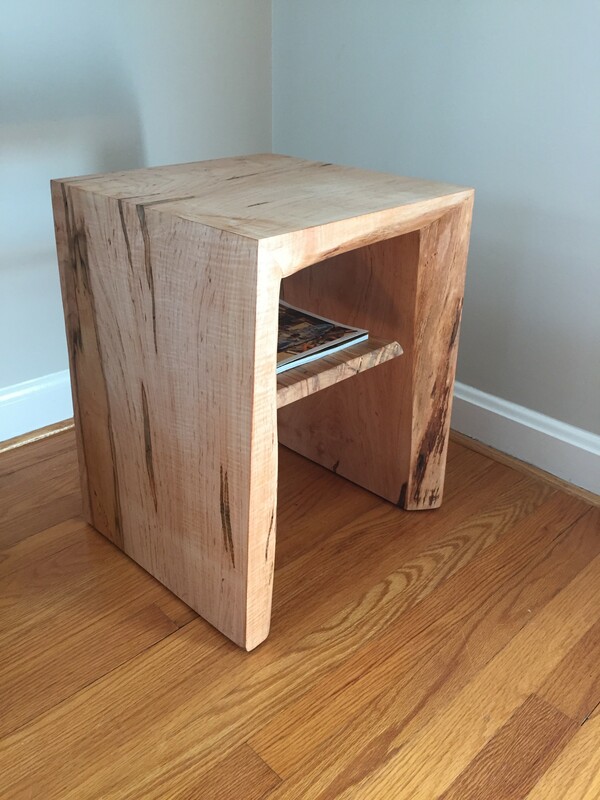 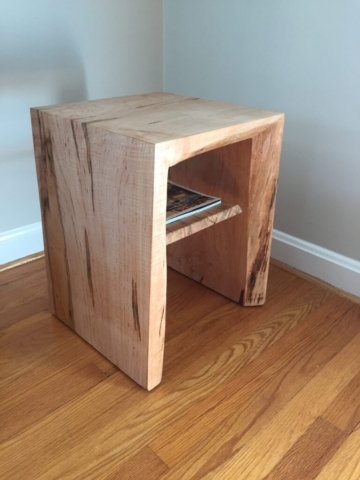 To make a cool coffee table, I employ several joinery tactics – sometimes using a waterfall joint – where you could see the grain run continuously from the top to each side. 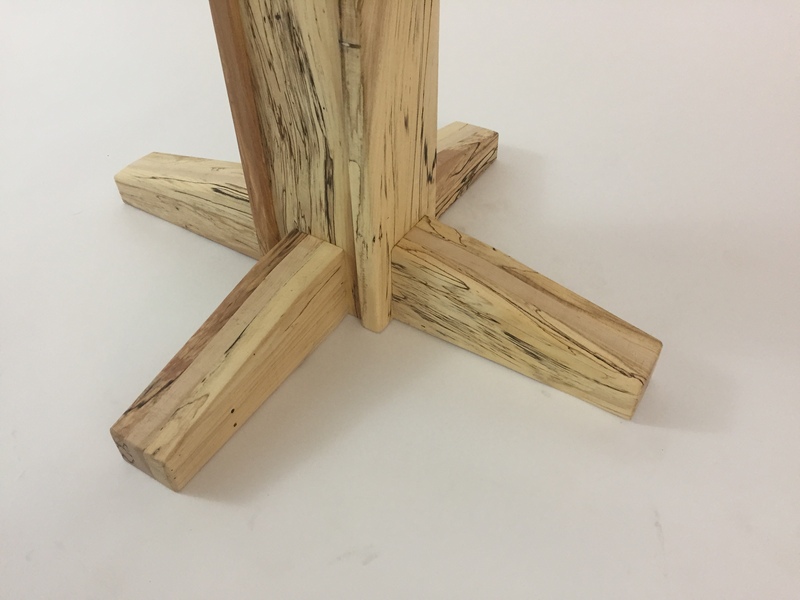 I also make some huge finger joints to show beautiful joinery. 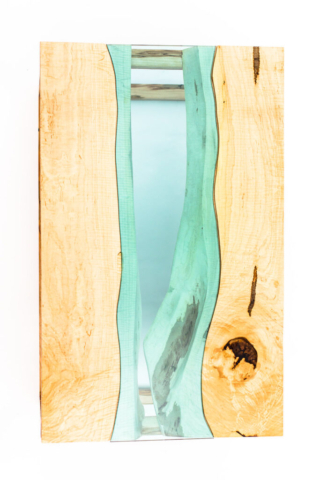 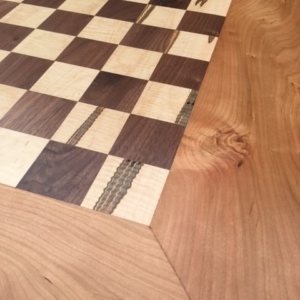 These live-edge or linear pieces can be custom made to any size. 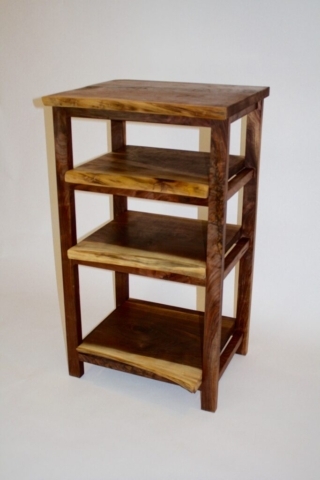 Internal shelves are free-floating, and adds extra horizontal storage for your books and magazines. 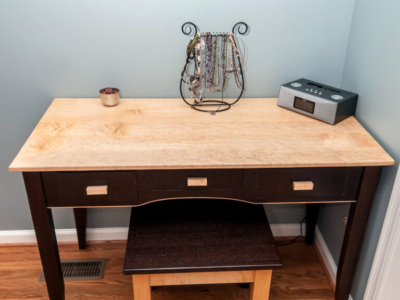 Using the same handwork details found in our full-sized writing desks, this vanity offers the same rich sensory experience on a smaller scale. 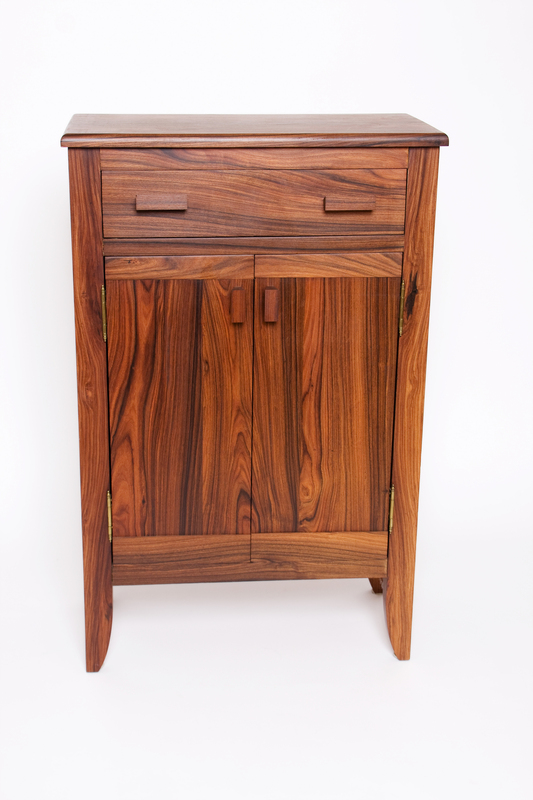 This piece exudes Future Primitive fusion combining Zimbabwean Wenge with Pennsylvania Bird’s Eye Maple to make a striking addition to the powder room. 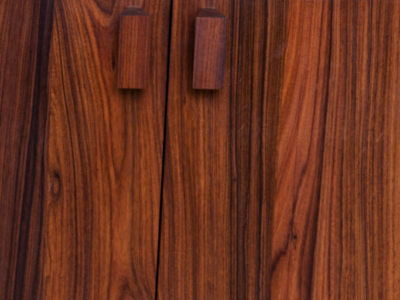 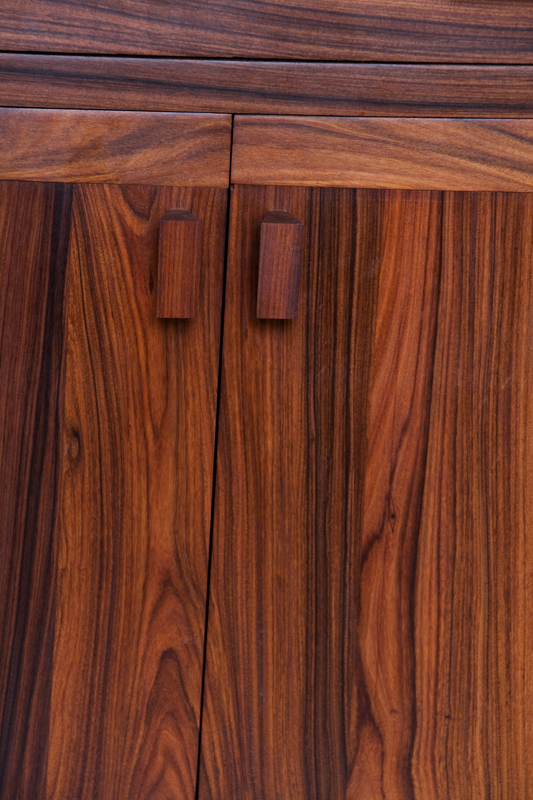 Bolivian Rosewood is a dense, hard, and beautiful hardwood. 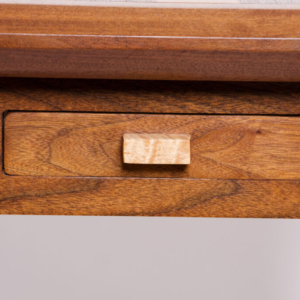 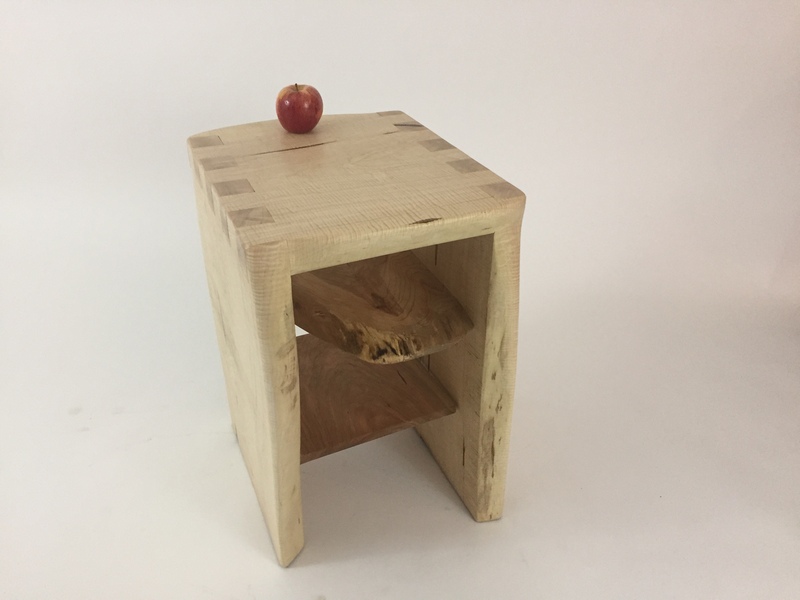 The joinery is unnecessarily complex, but completely apropos – through dovetails, mortise and tenons, and a unique free-floating bottom shelf. 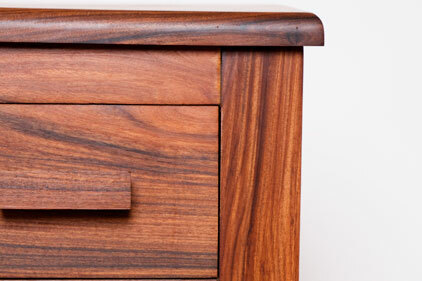 FSC certified wood. 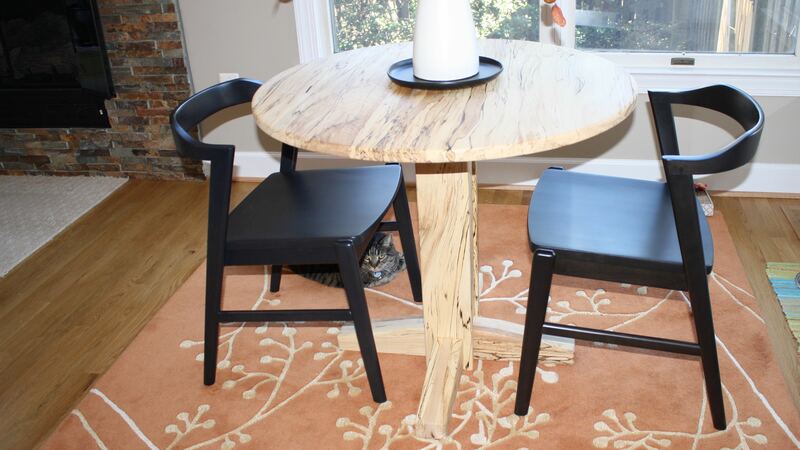 Furniture on the fringe. 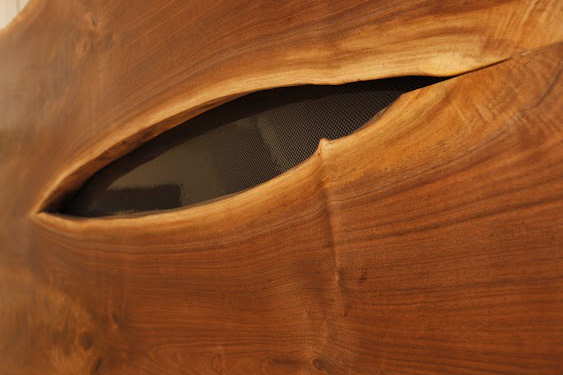 In the Renwick? 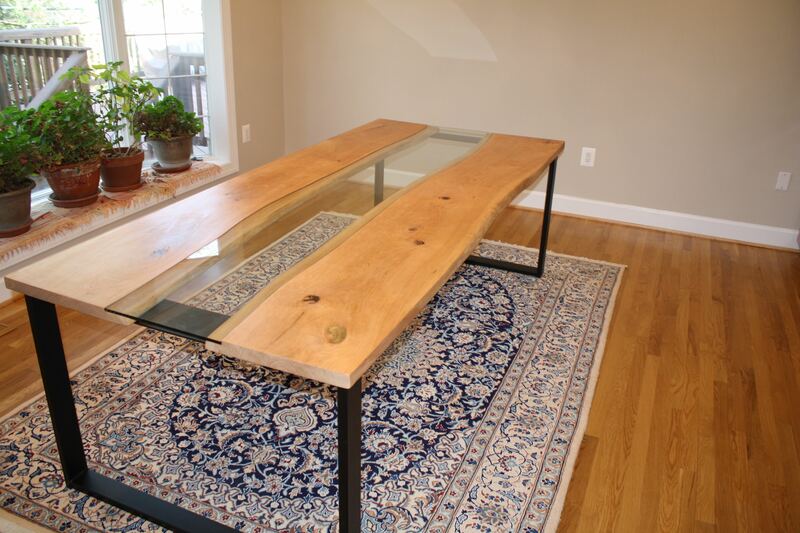 Or a hilljack’s living room? 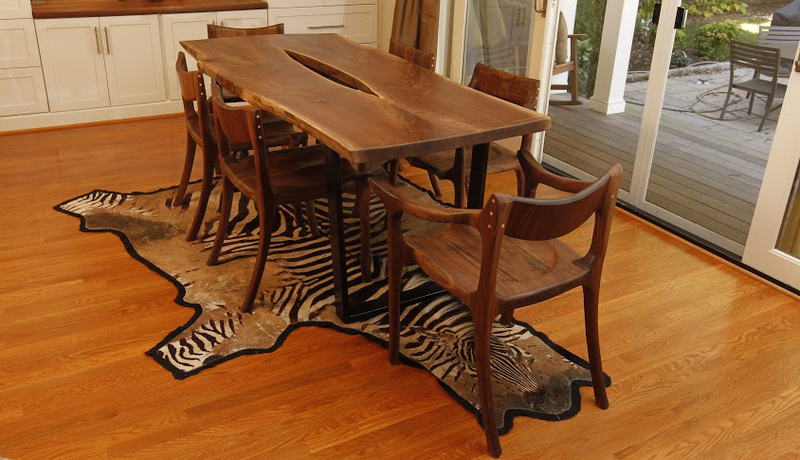 This fits as comfortably in your Upper East Side loft as it would in your hunting cabin in any Southern state. 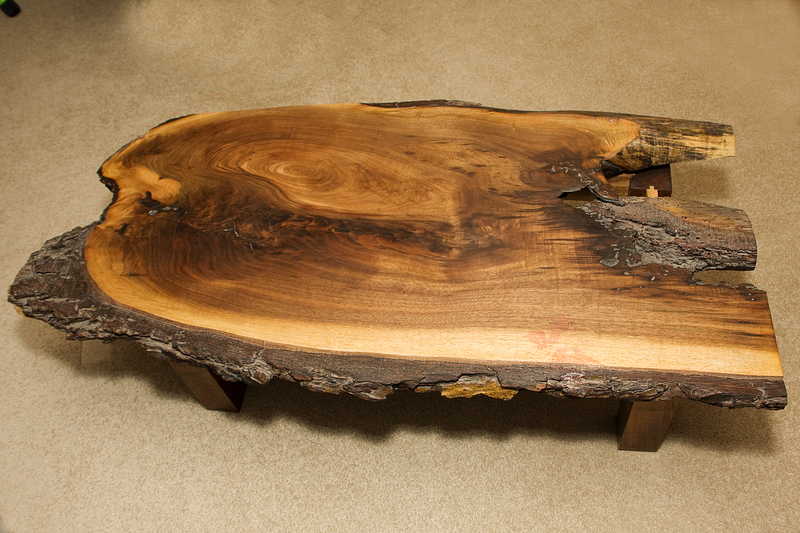 One-of-a-kind live edges make this a unique centerpiece. Can be custom built for any living space. 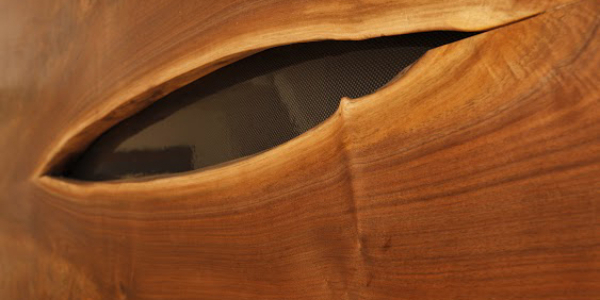 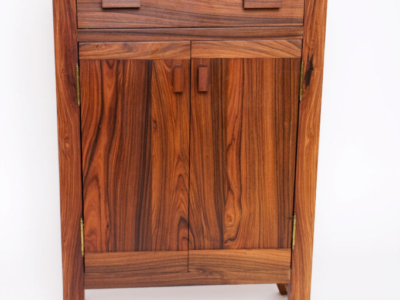 Custom made of American Walnut and live-edge English Walnut, this open stereo cabinet is worthy of your audio equipment. 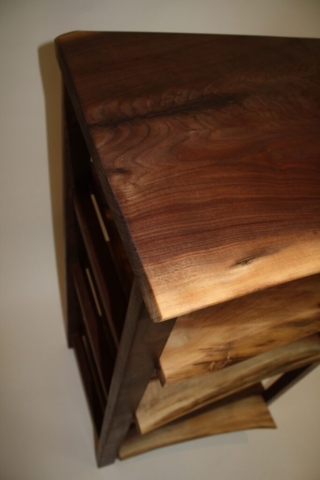 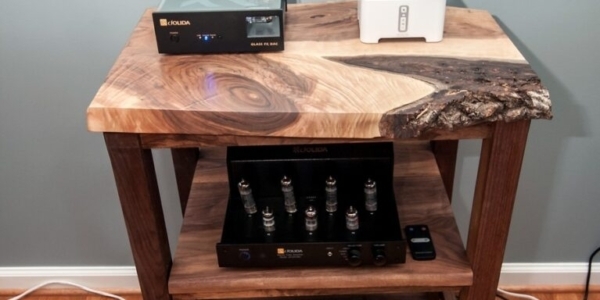 The one-of-a-kind live-edge top is suitable for your turntable, vacuum tube amps, or other stereo gear. 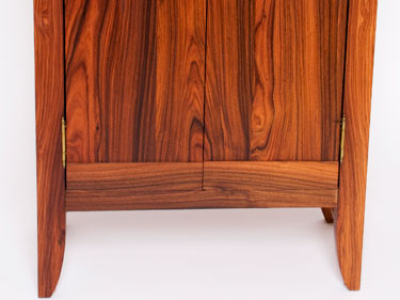 Solidly built to exacting standards of discerning audiophiles, this cabinet is solid and functional, yet is a work of art. 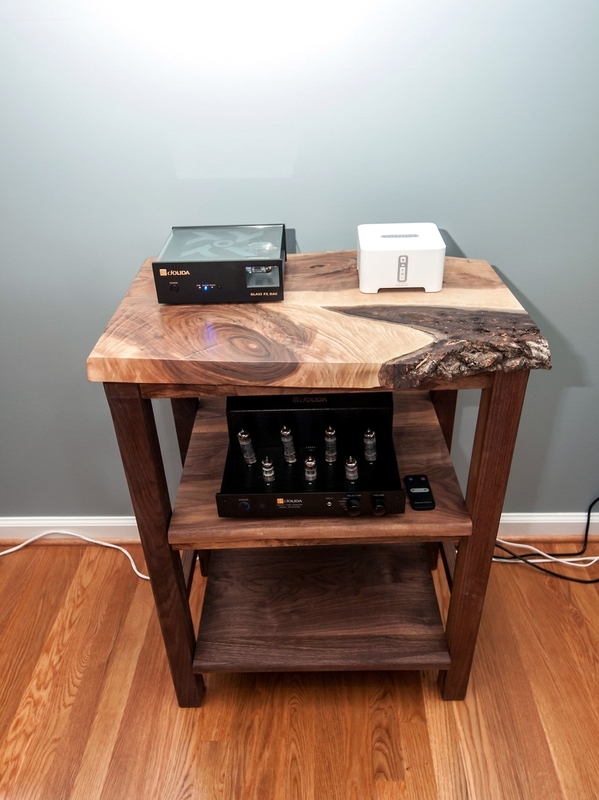 High-end audio gear should not be relegated to big box afterthought “furniture”, but deserves a solid conversation piece of clean lines and beautiful woods. 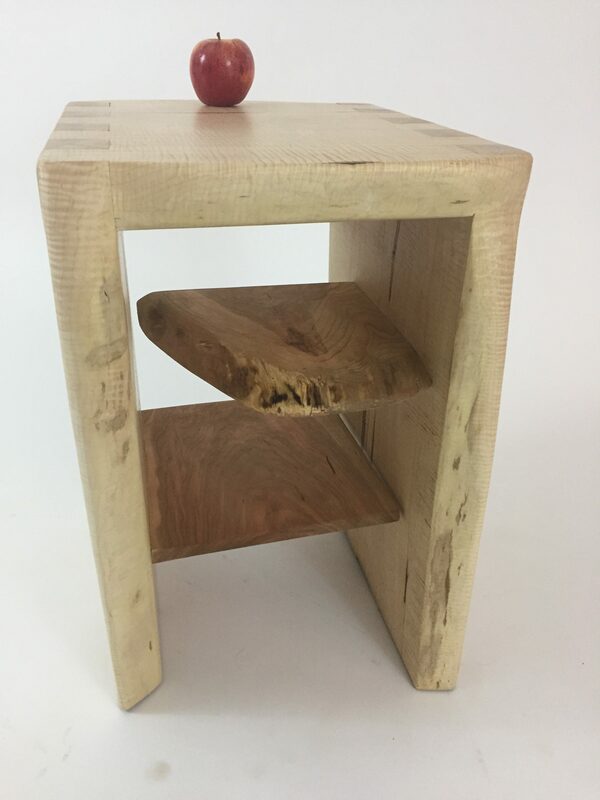 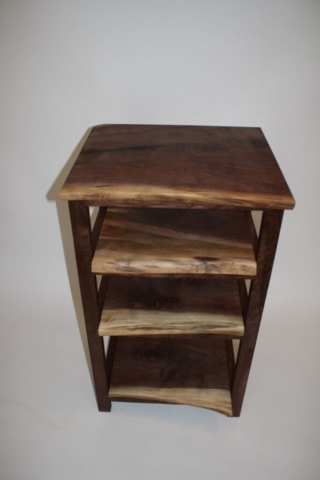 Piece is 3 shelves, and can be customized to 2-6 shelves. 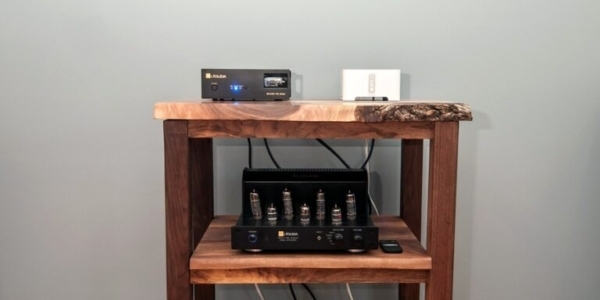 Somewhere in between obscenely priced $25,000 tricked-out movement-dampening audio racks full of lead and hubris and low-end store-bought veneer furniture lies Spugnardi.com audio gear for the absolute audiophile. 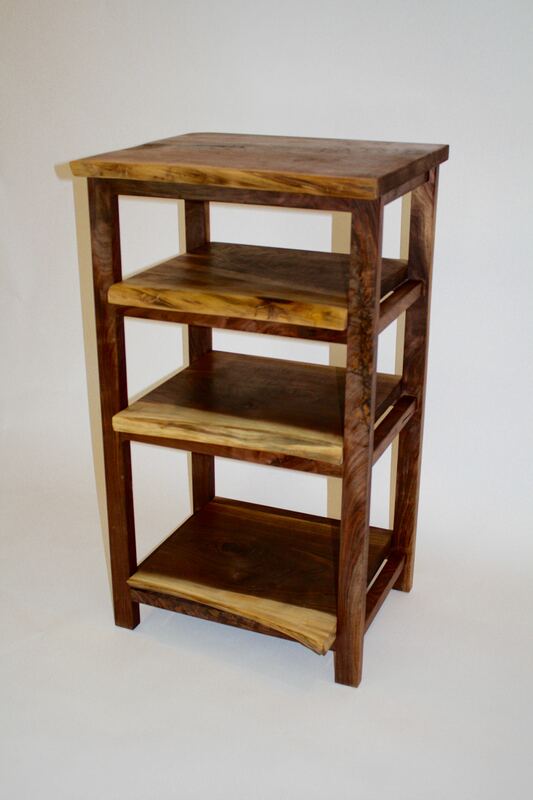 Made of 100% Virginia windfall hardwoods, this solid and strong four-piece rack is sure to hold your high-end gear for many LPs to come.